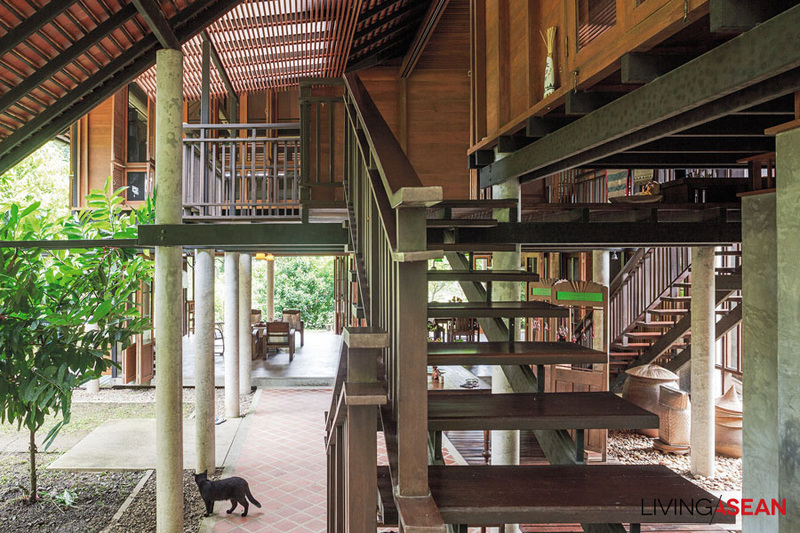 Like Thai houses of former eras, this garden house has a high open area called a tai thun on the ground floor, an economical construction that suits Thailand’s climate and terrain and encourages family culture. 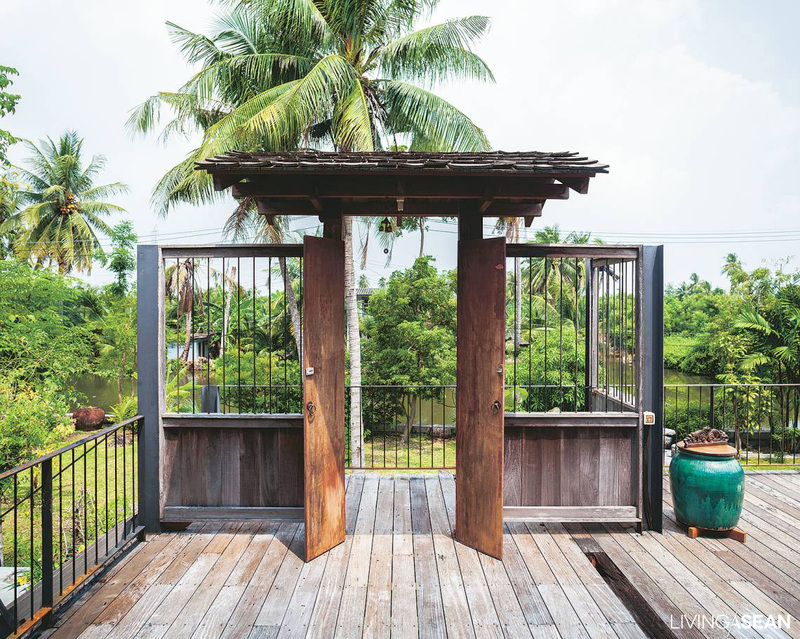 Three years ago Pongsakorn Tumpruksa, of Arsom Silp Community and Environmental Architects Co., Ltd., decided to live the waterside life and build a family home on 340 square meters at water’s edge in Bang Khun Thian, where two other streams converge with Bang Mot Canal. 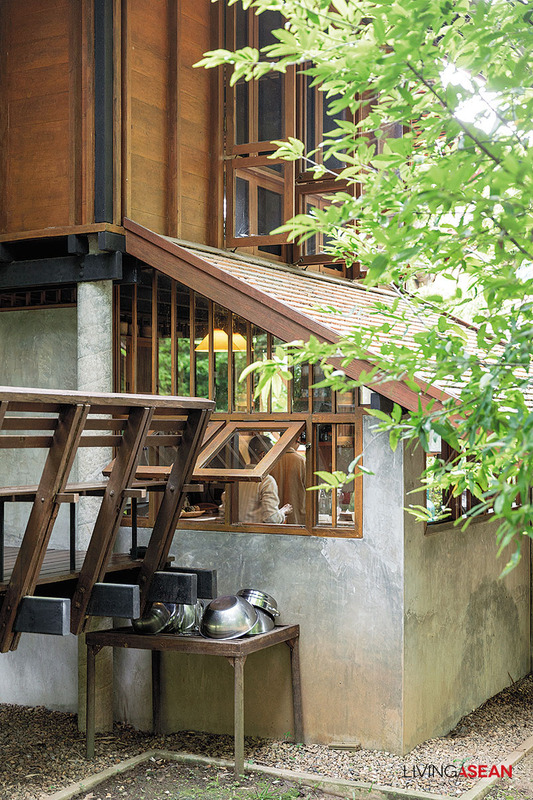 The roadside entrance is in back, so the house fronts on the canal, Thai-style. 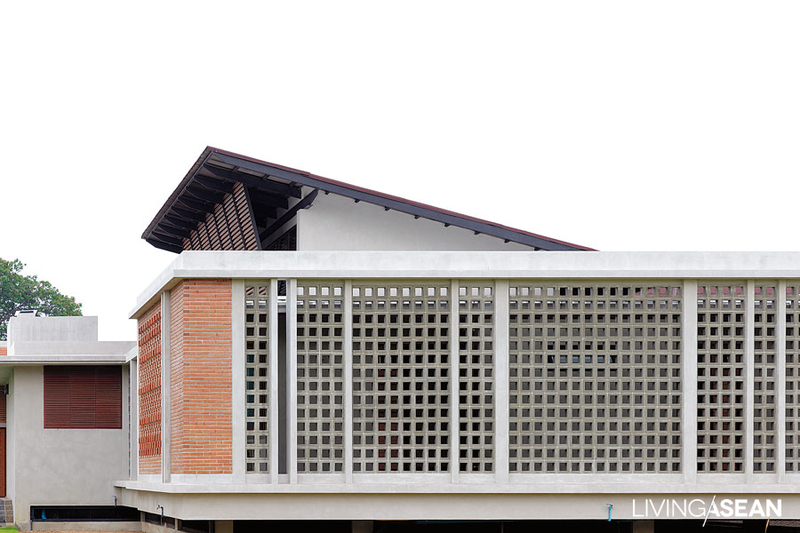 A centuries-old principle of Central Thai traditional architecture is suitability for the environment, balancing sun, wind, and rain to keep things cool and comfortable. 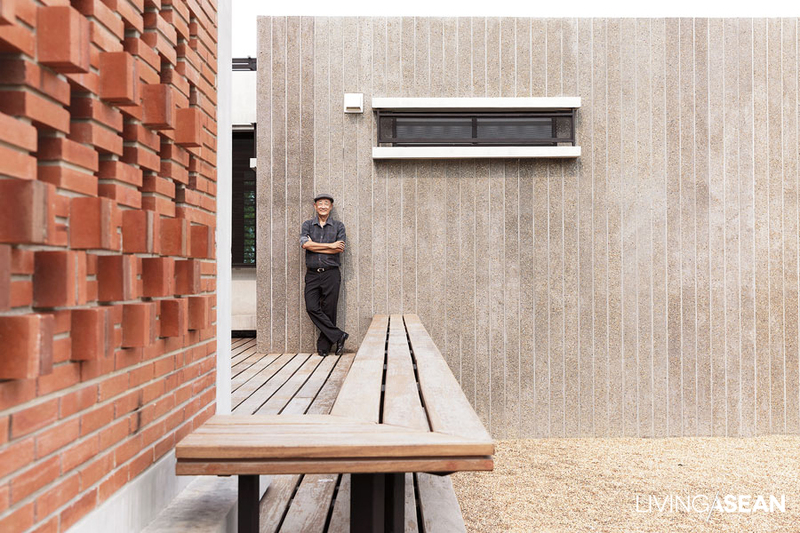 Here the old knowledge is blended with modern construction materials. 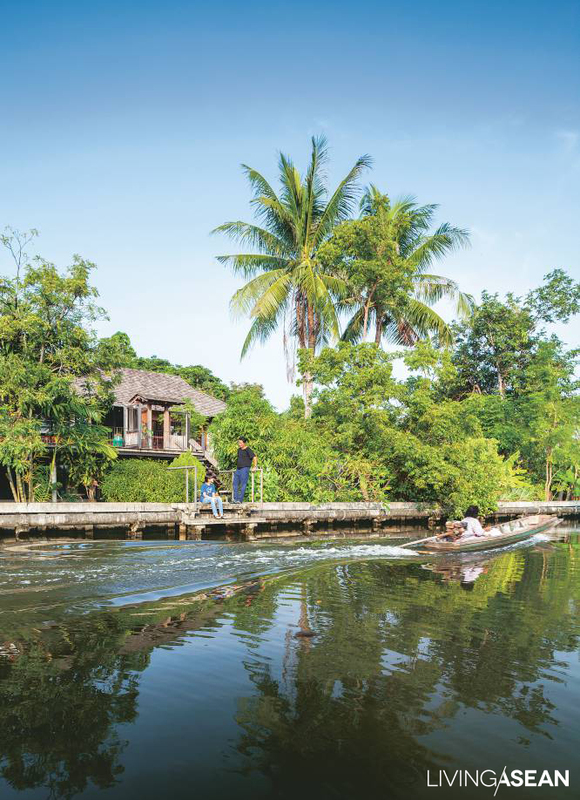 The high tai thun avoids flooding and termite damage. 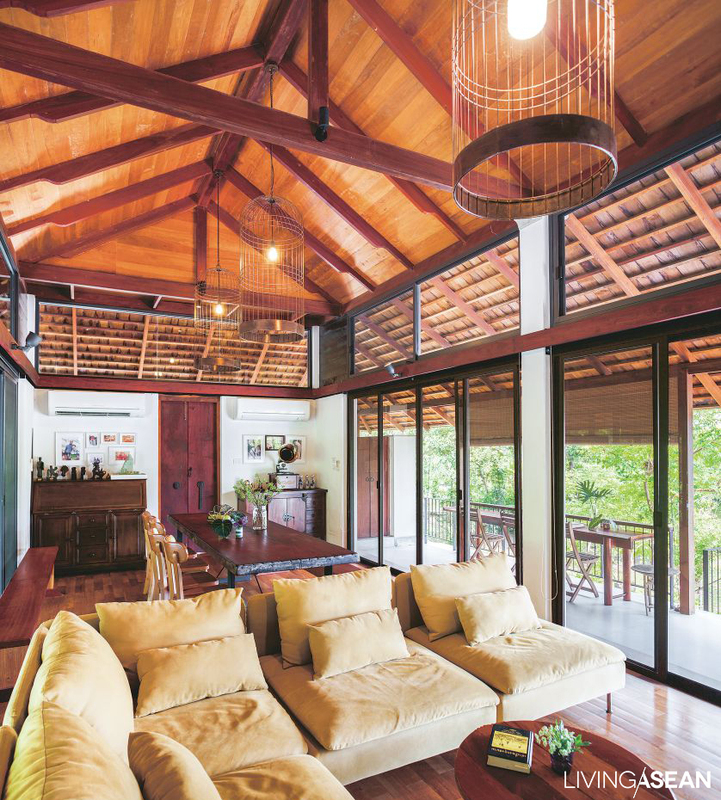 Good air circulation is ensured with a high roof with long eaves; windows and a gap below the roof help release hot air. 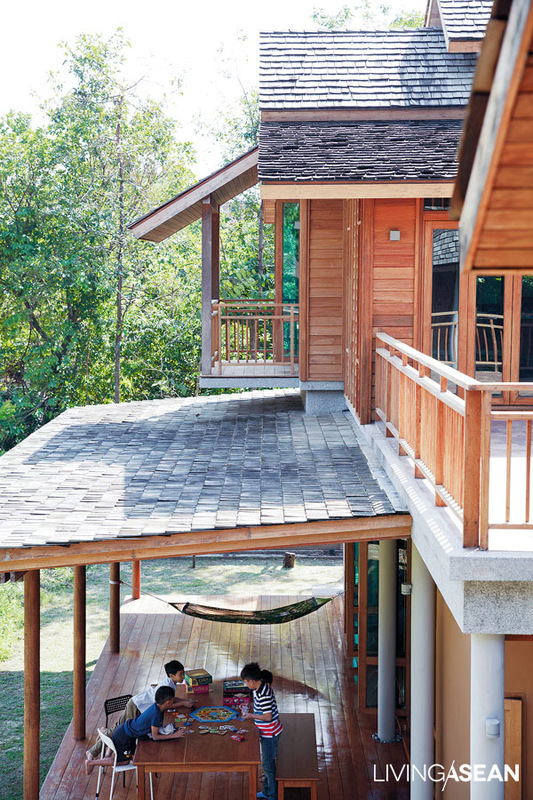 There is a deck where either clothes or fish can be dried, a heat-resistant mesh on the wooden roof, and there is an open porch below the eaves where you can sit, catch the breeze, and relax from the heat. 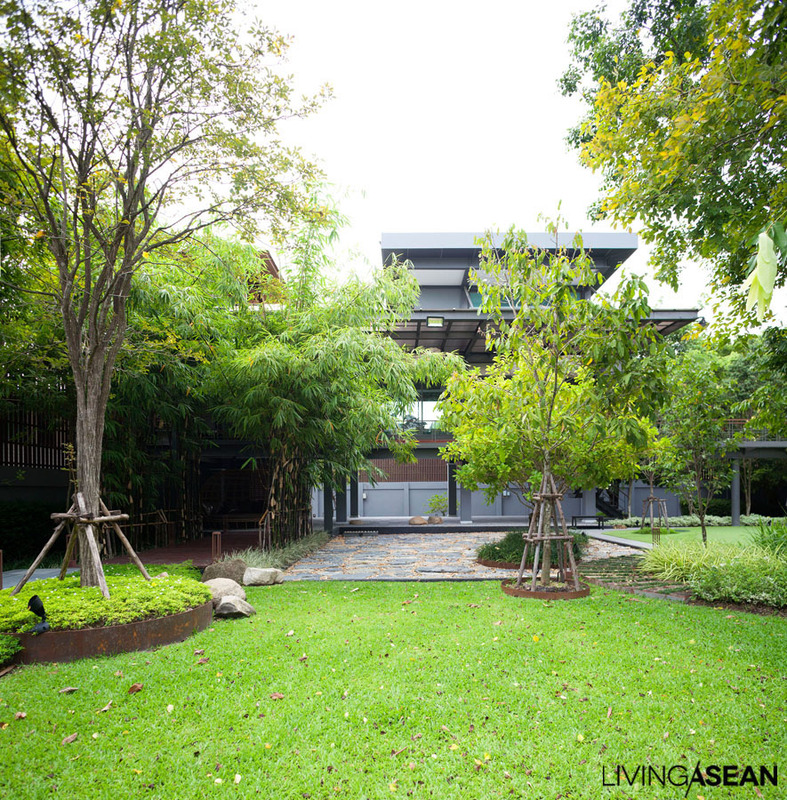 Also the gardens around the house give shade and maintain moisture, cooling the area. 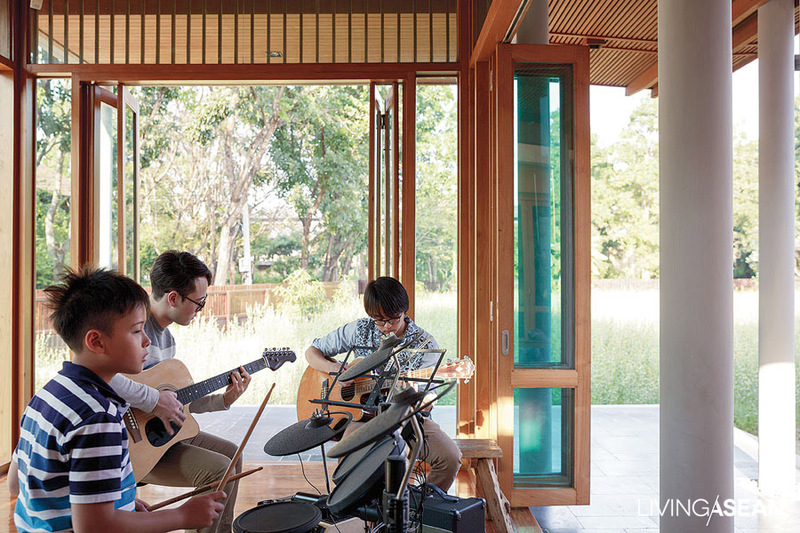 The architecture promotes family culture. Previously the family lived in a townhouse, chatted at the dinner table, and were always in close, warm contact. 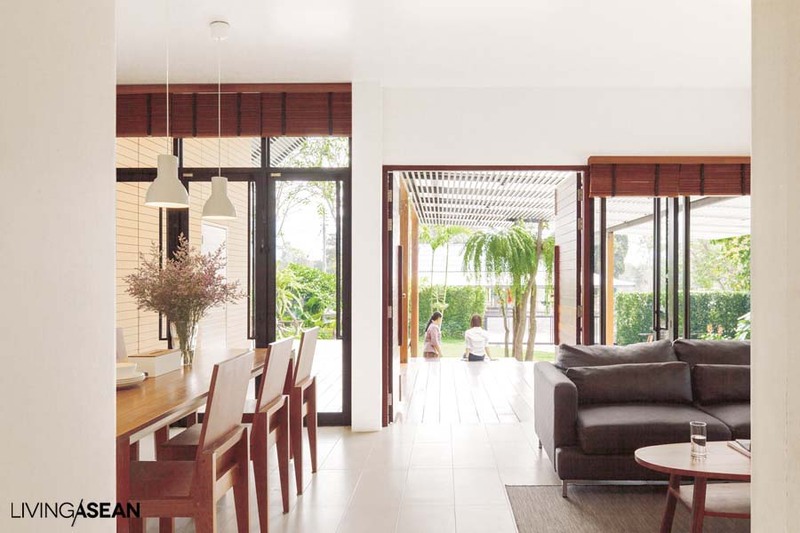 To continue that feeling, living and dining areas and kitchen were designed as a single continuous space. Economical construction. 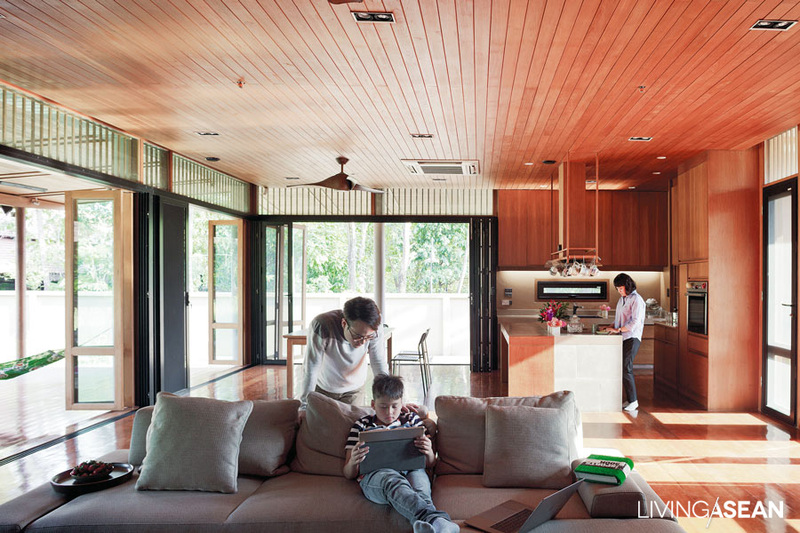 The house was built with a limited budget: overbuilding would have been problematic. 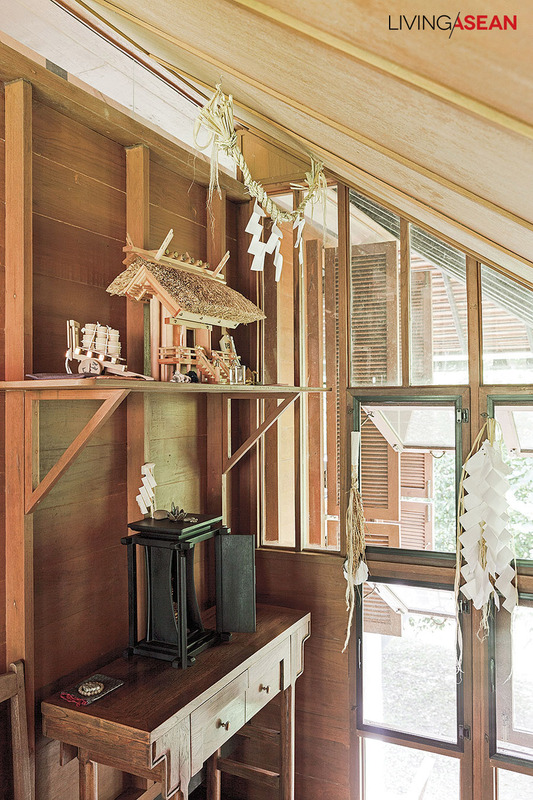 Thai traditional knowledge shows how to do this: leave room for gradual expansion, building onto the house as needed, as was done in Thailand’s earlier days. 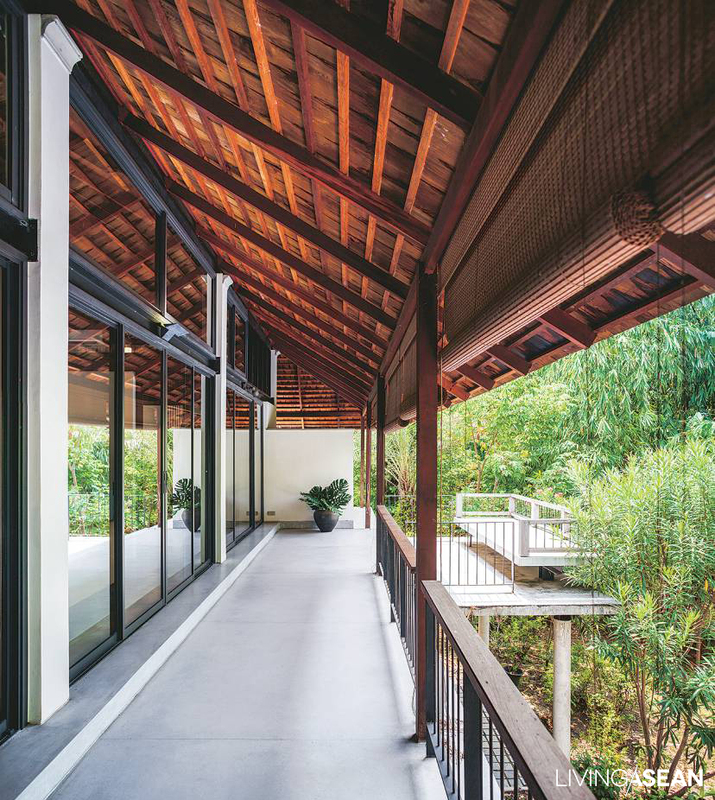 This steel-frame Thai house, a vacation home with a tai thun (open space below), is pared down to modern-style essentials and incorporates elements of a Buddhist temple. 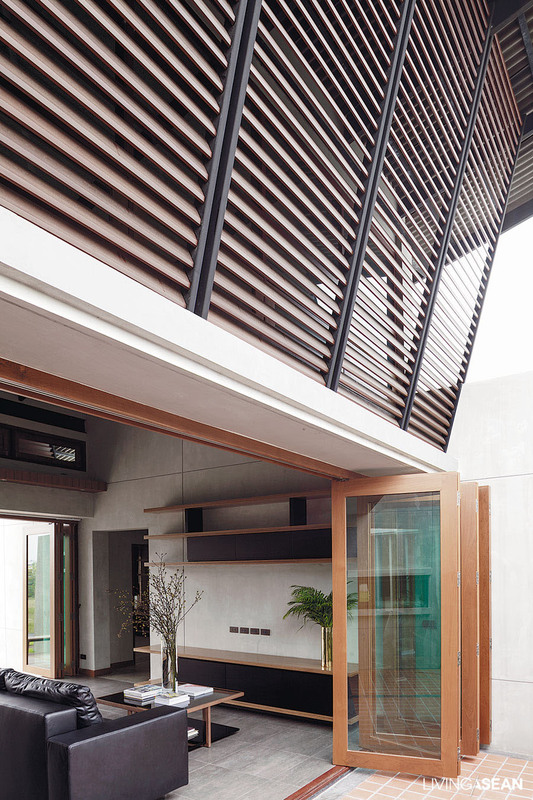 Natural ventilation is good enough that it doesn’t need to rely on air conditioning. 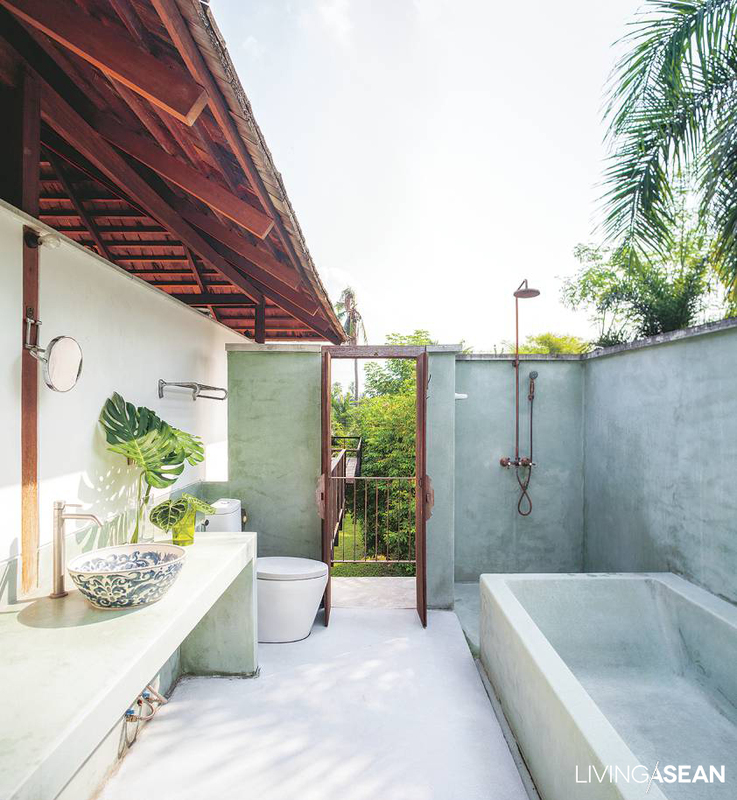 Regarding “Baan Loy Lom,” as the home is known, a PO-D Company architect said, “This house in the Baan Rai Thaw Si Project presented the challenge of creating a restful getaway for meditation practice on holidays, eliminating all nonessentials. 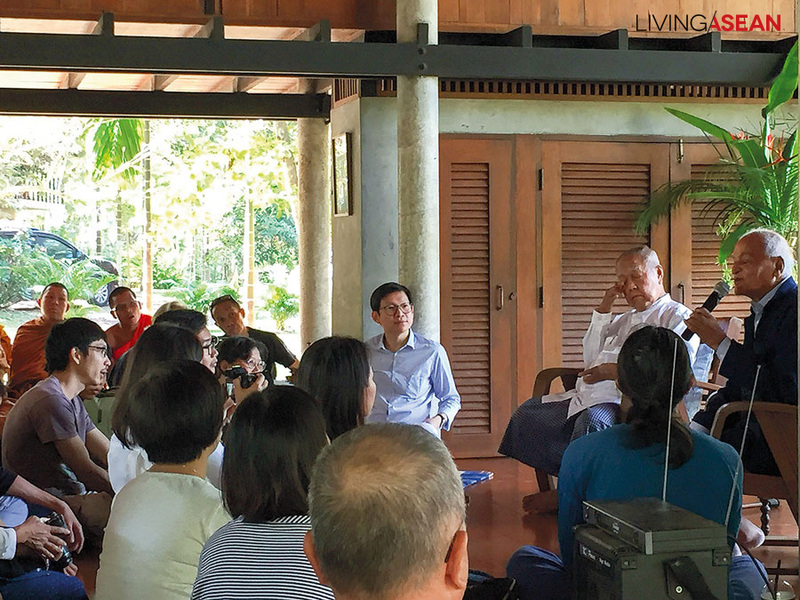 The house’s owner didn’t want to come here and have it be like everywhere else, but rather to have a temple mood, with a monks’ hall, a place to invite dear friends to come sit in a meditation circle and practice dharma.” There were two more challenges. 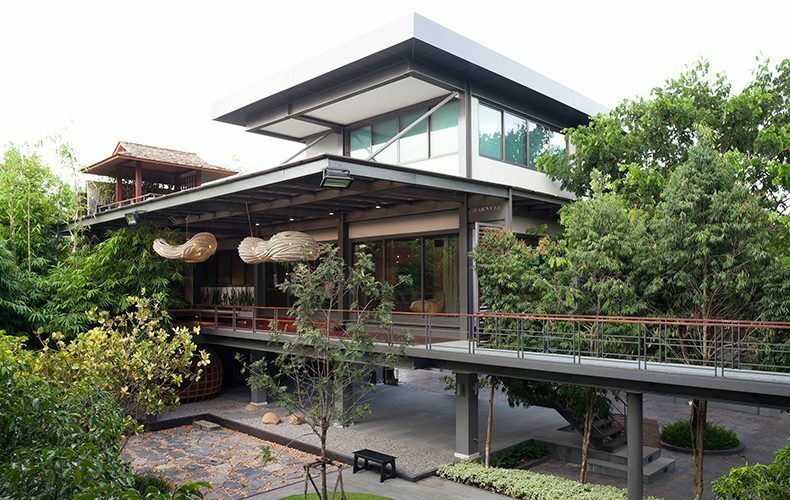 First, the owner was partial to Thai houses, but wanted this one to have a steel frame. One reason for that was that the house had connections to the steel industry, and another was a village conservationist regulation forbidding use of land fill above a certain height. 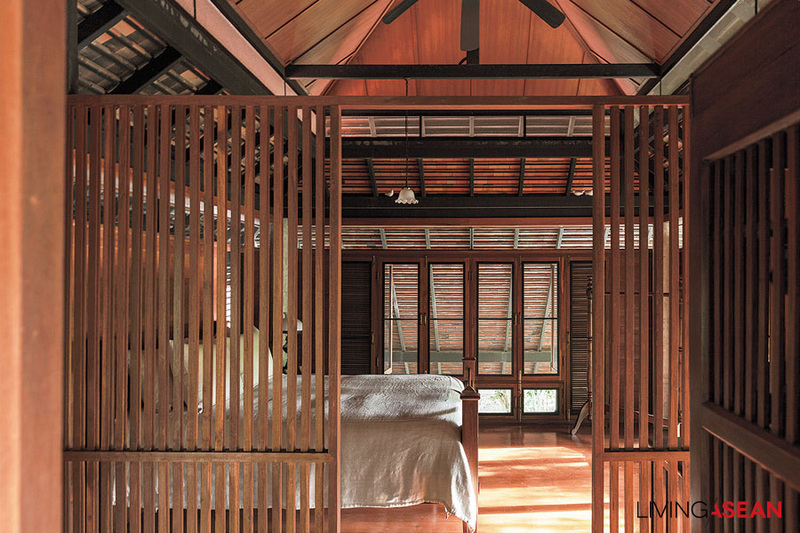 Design began with the steel frame and then added features that give the house truly Thai characteristics. 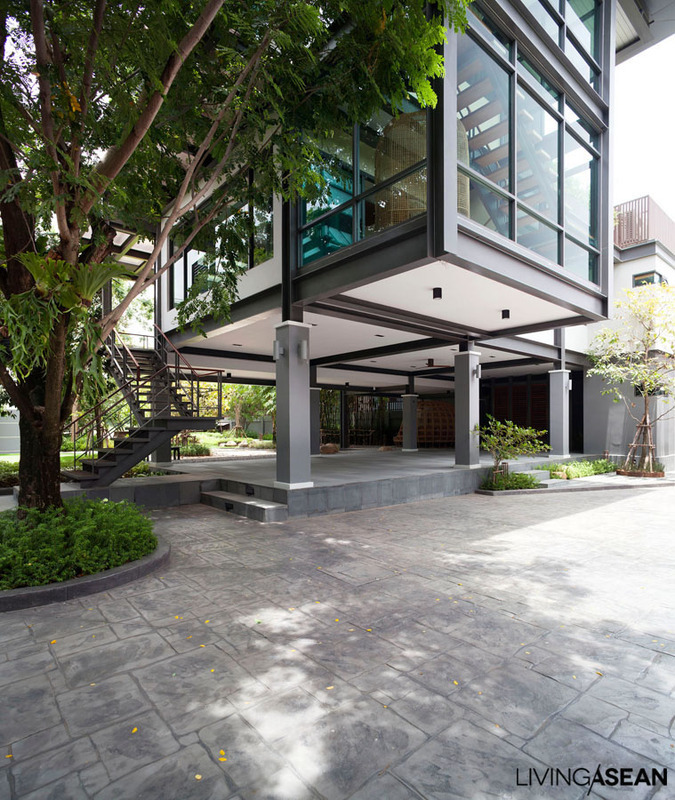 A high tai thun open lower space was added, with display columns independent of the house frame. 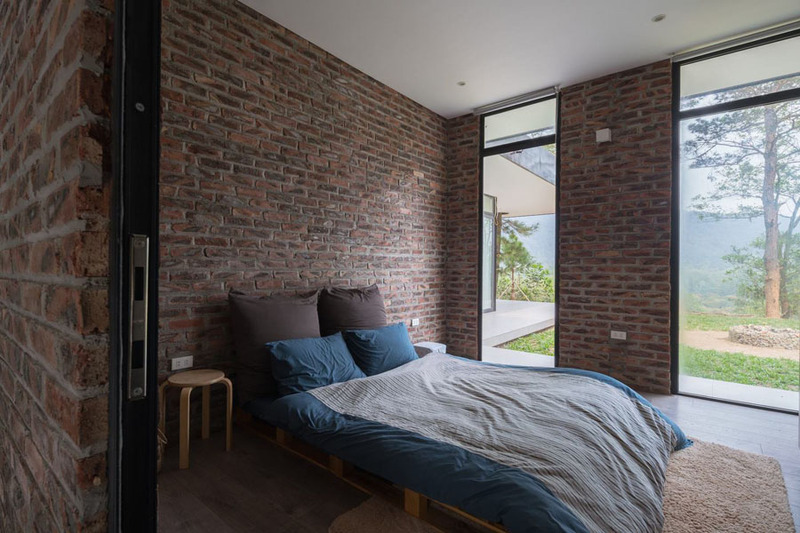 Usable space is separated into blocks connected by open areas. 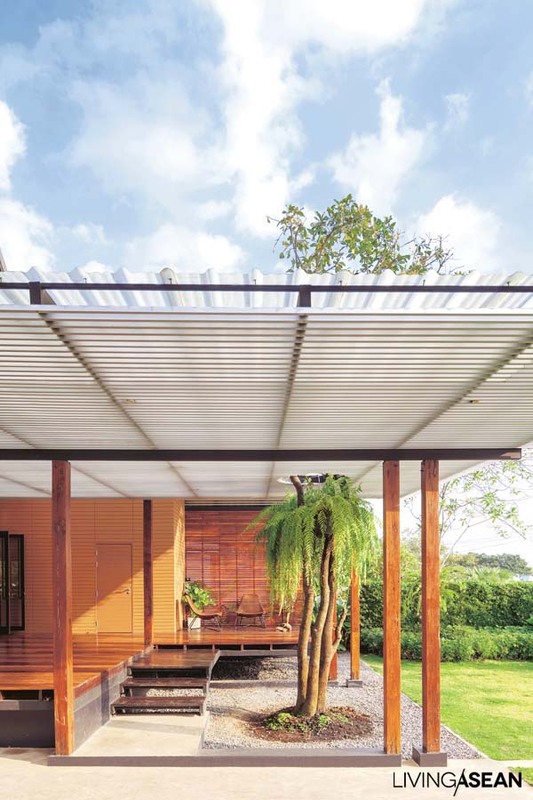 The roof’s partially gabled section connects with a single-sheet roof. 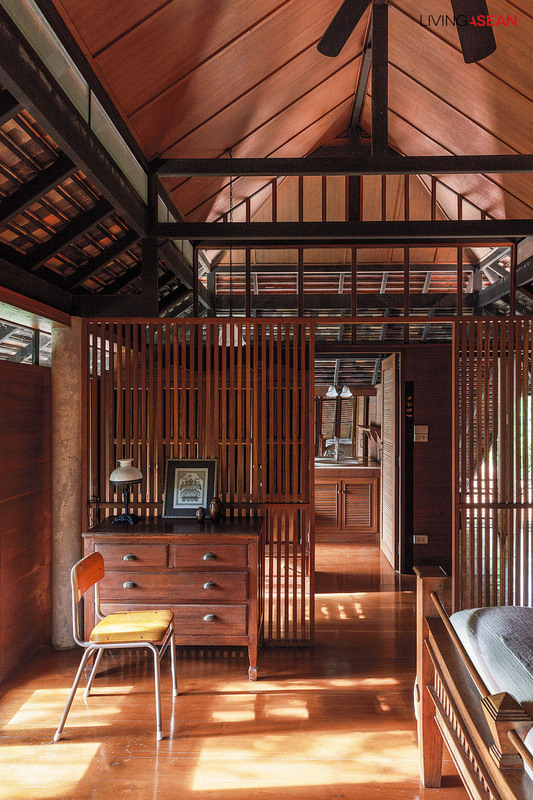 Other signature additions include open panels, latticework, openings for light, and folding doors, all elements of traditional Thai houses, but arranged differently here. 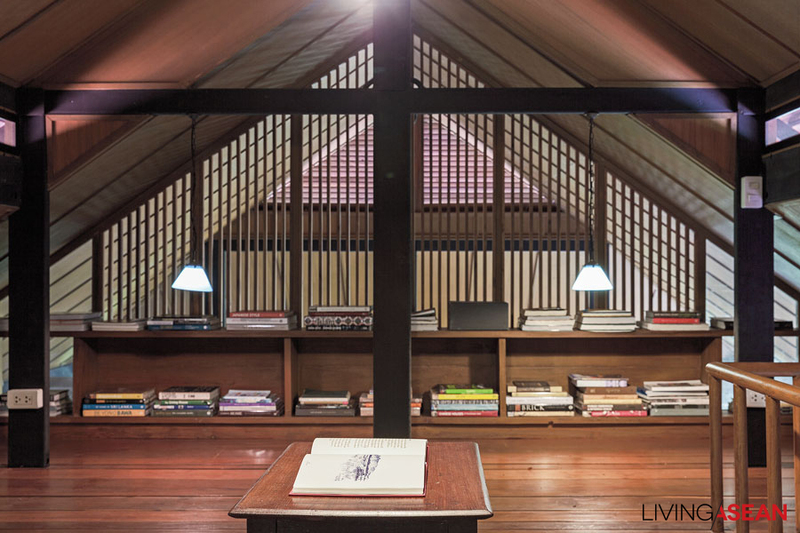 The “monks’ hall” takes central importance, so by design it is visible from every room. For privacy’s sake, though, it can’t be seen from the street. 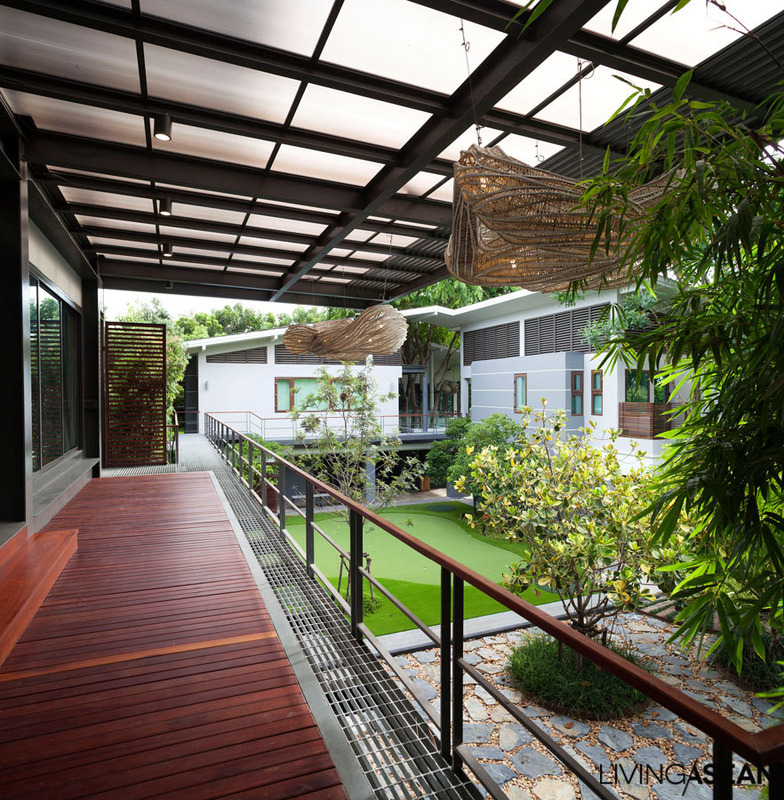 The walkway has a bent axis to give desired angles of view. 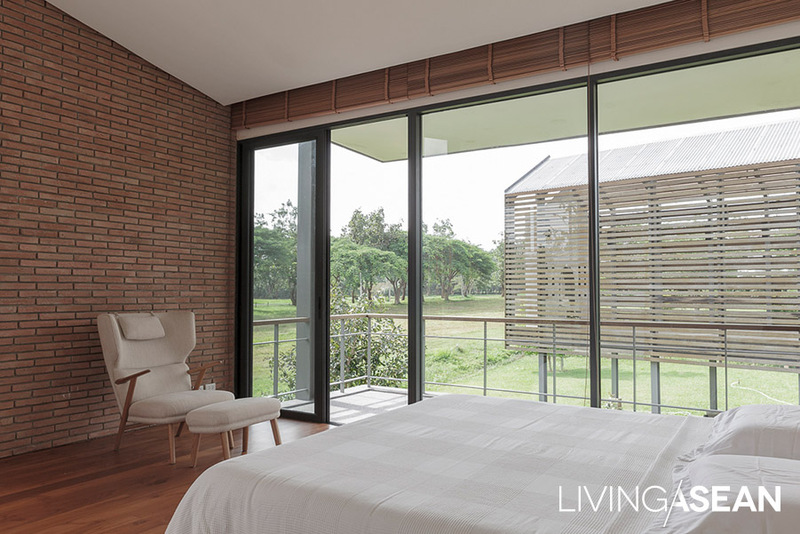 Brick walls are of Lampang clay, with a lighter shade and more relaxing to the eyes than brick from elsewhere. 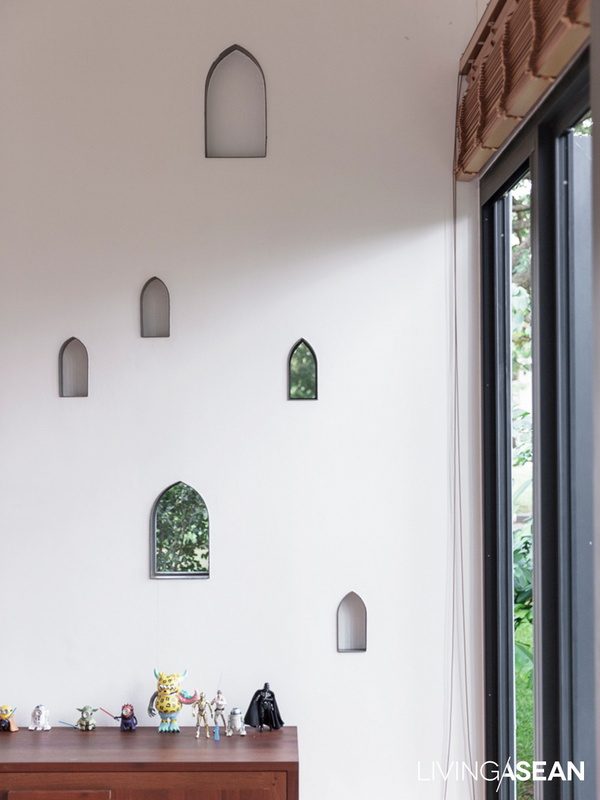 Apertures inspired by the shape of a temple are cut into walls, but these are of varying sizes and arranged in ways that aren’t always orderly, so that the house doesn’t appear too austere. 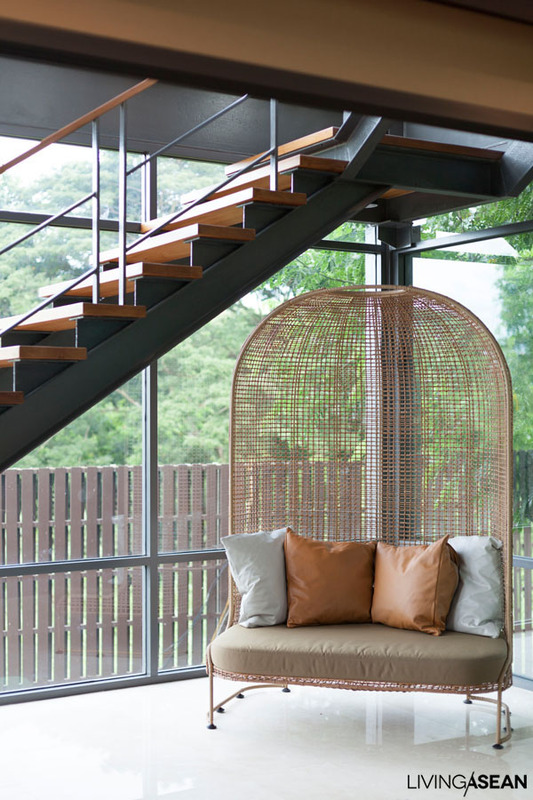 Similarly, latticework is arranged to give the house a warm look and also to let in breeze and light as appropriate. 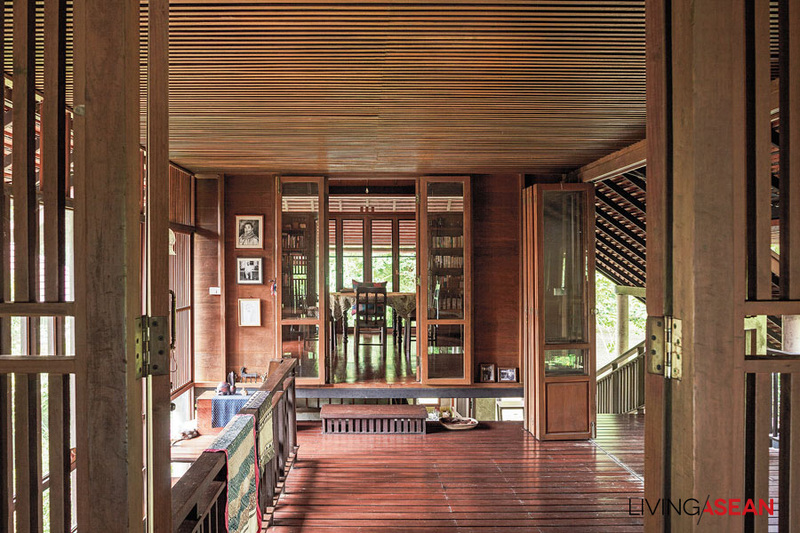 Inside, especially in the living room – which is like a shady, roofed platform – we feel the air circulating around us, never too warm. 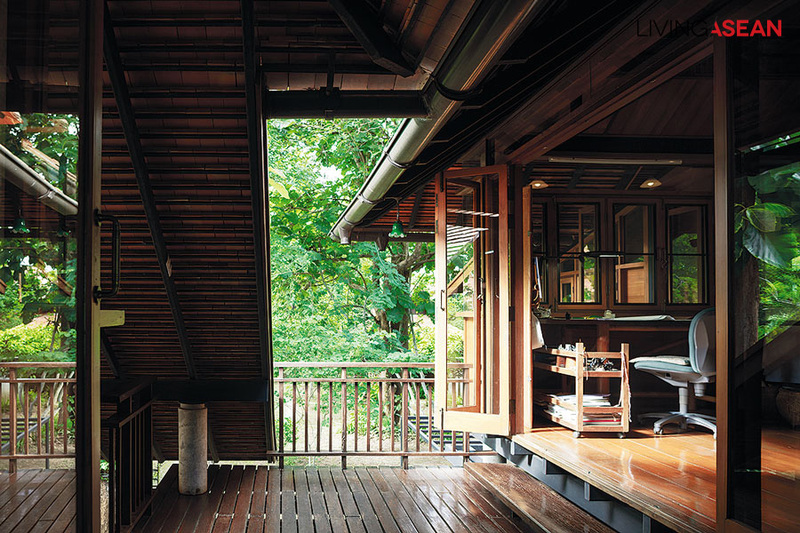 This shows the success of the design plan, based on Thai-style traditional construction from roof to wide openings for air and light, but enhanced with modern materials such as steel, channeled through the wisdom of an architect with the ability to find solutions matching the wants and needs of the people who live here. 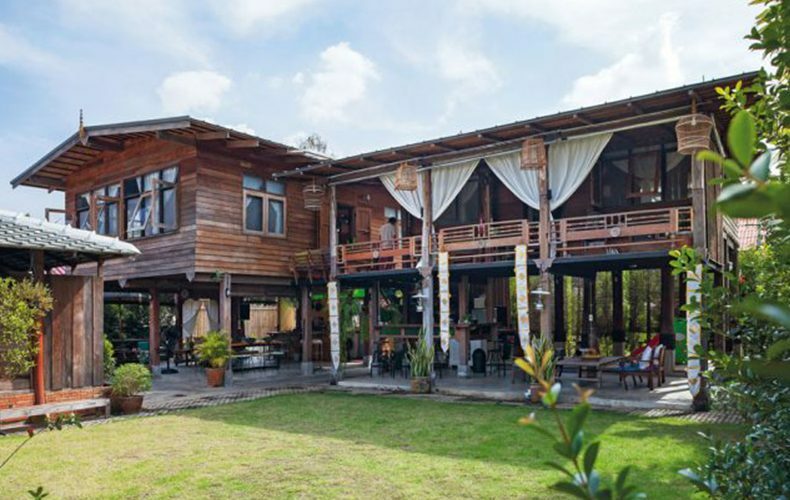 This wooden home in San Sai District, Chiang Mai Province connects 2 buildings with a high, wide open tai thun (open lower floor) featuring a long dining table and “living room” spot that gets a cool breeze the whole day. 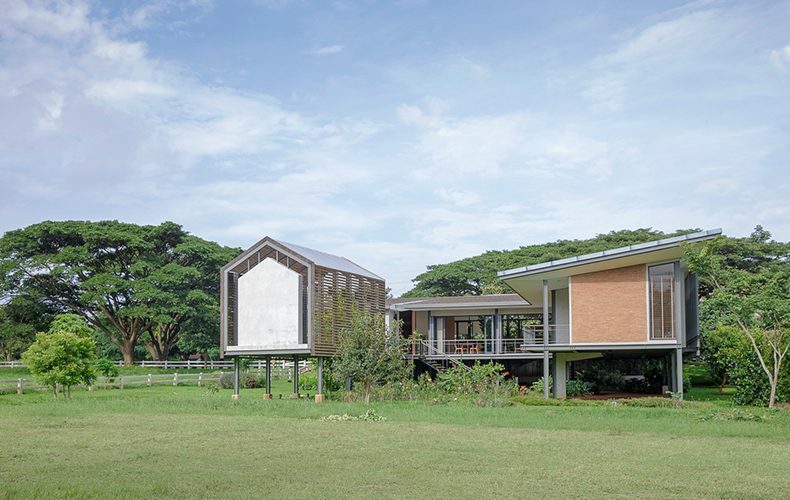 Ae (Nuttawut) and May (Sutthida) Saylahom had scheduled ten months to build their new home, but it took more than a year to finish, until after their second son was born. Along the way a few alterations were made: a planned swimming pool, for instance, became instead a grass lawn where their young Kiri would be able to run and play with his new little brother. 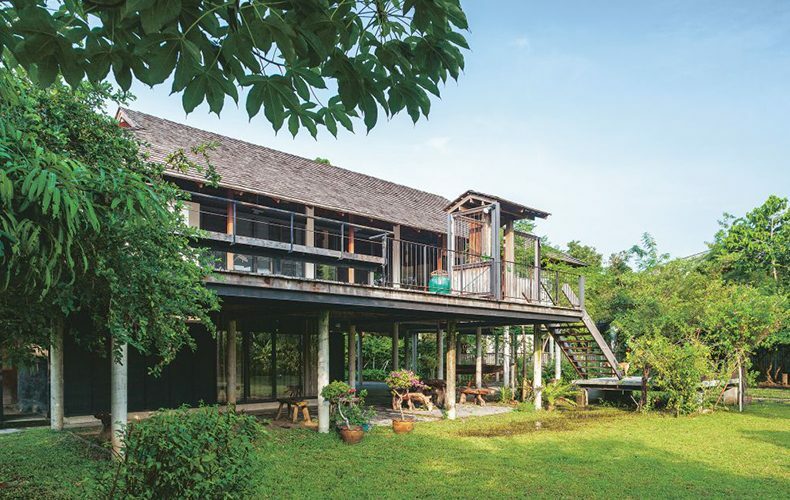 Ae worked as both architect and laborer here in combining an old Lanna rice granary with the original wooden house next to it. Construction began by disassembling the old buildings: original components and materials were removed and set aside for use in new functionality envisioned in the new design. The granary’s primary structure remains: 8 large wooden pillars, with 4 pillars angled inwards for weight-bearing purposes. 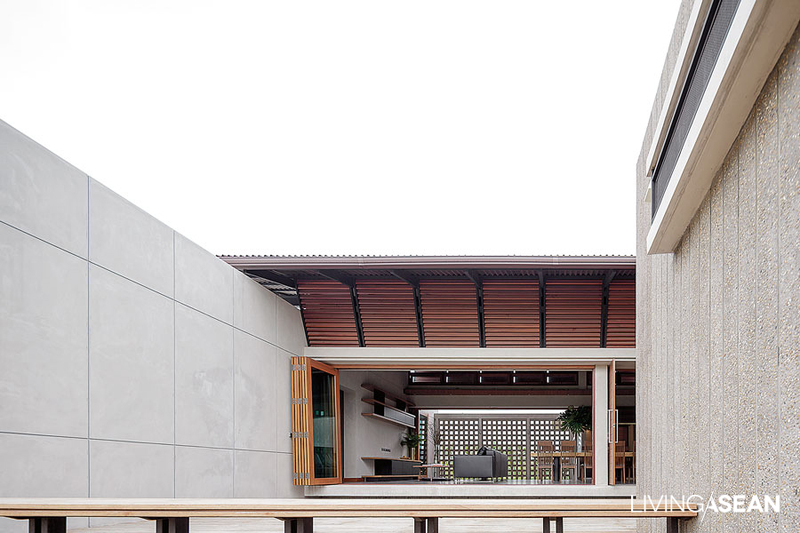 There is a tall main column reaching all the way through to the tie beam – a primary roof component – and another post up to the roof for ridgepole support, all set in a foundation of poured concrete to protect against moisture and ground-nesting termites. 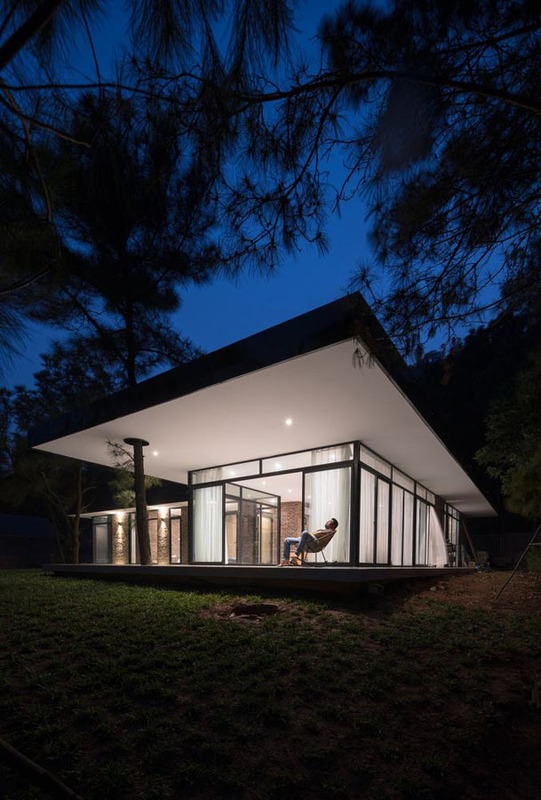 The Huean Tham house has a depth that makes it much more than just a place to live. 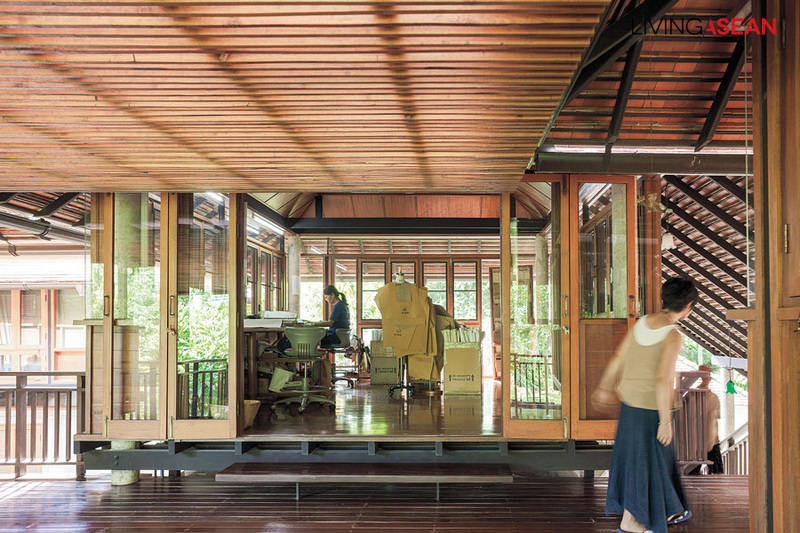 It’s actually a group of buildings and rooms, each with its own particular use. 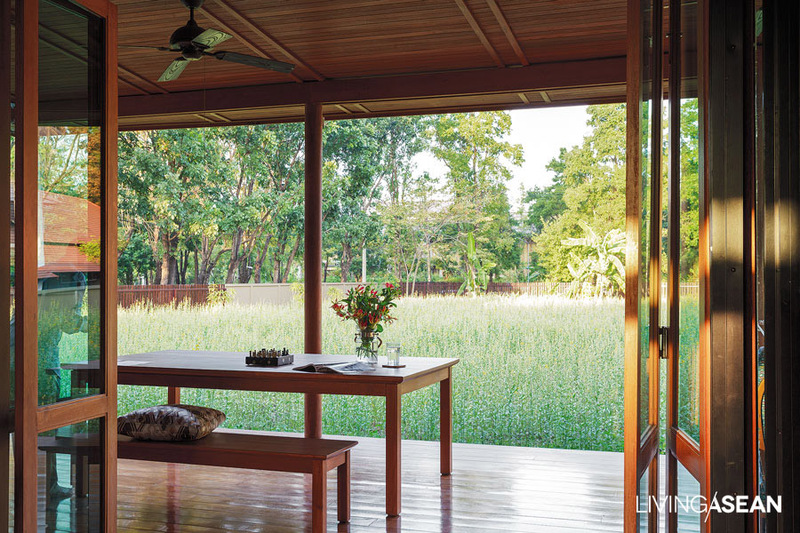 The Thai word tham (dharma) is integral to the words thammachat (nature) and thammada (natural), and suggests tranquility in life. 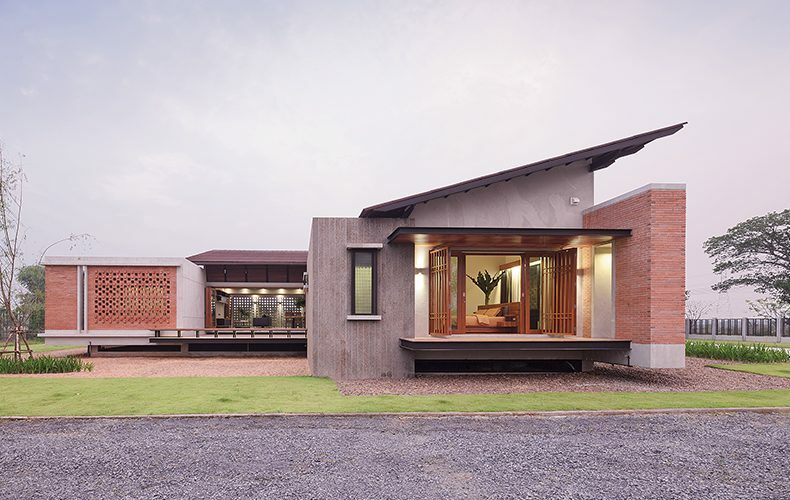 Huean Tham is a residence, a design workshop for naturally dyed fabrics, and a storehouse for Usaato brand fabrics, all in 6 buildings. 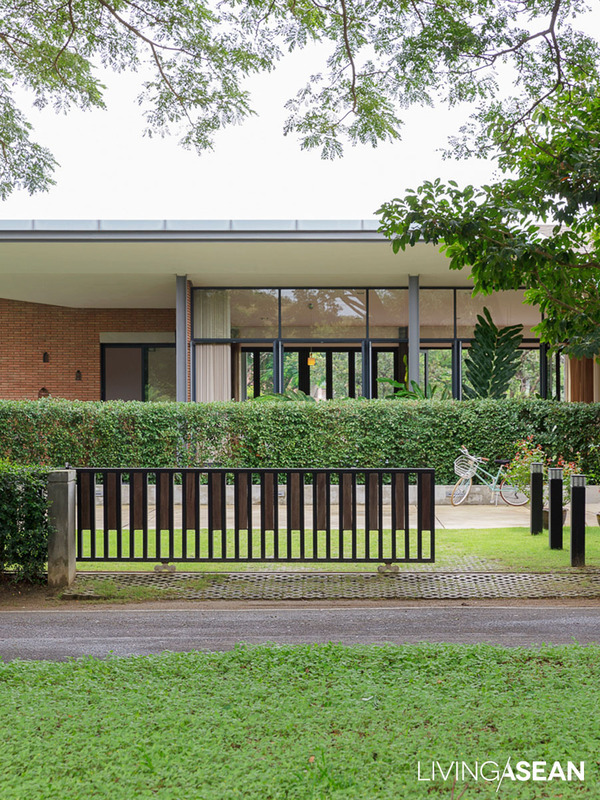 First is “ruean yai” (the large house), residence of owners Somyot Suparpornhemin and Usaburo Sato. 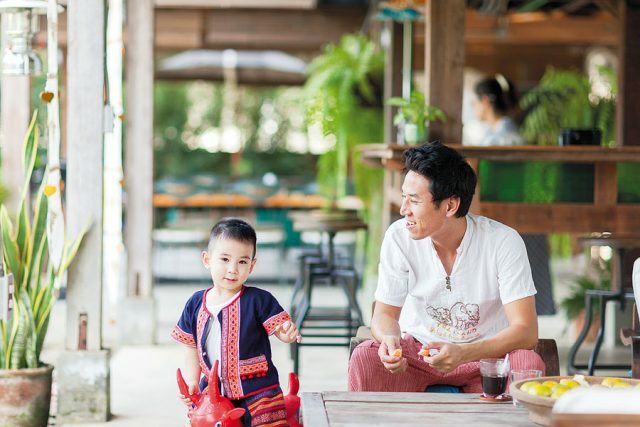 Just to the north is ruean lek (small house), where the children and visiting friends stay. 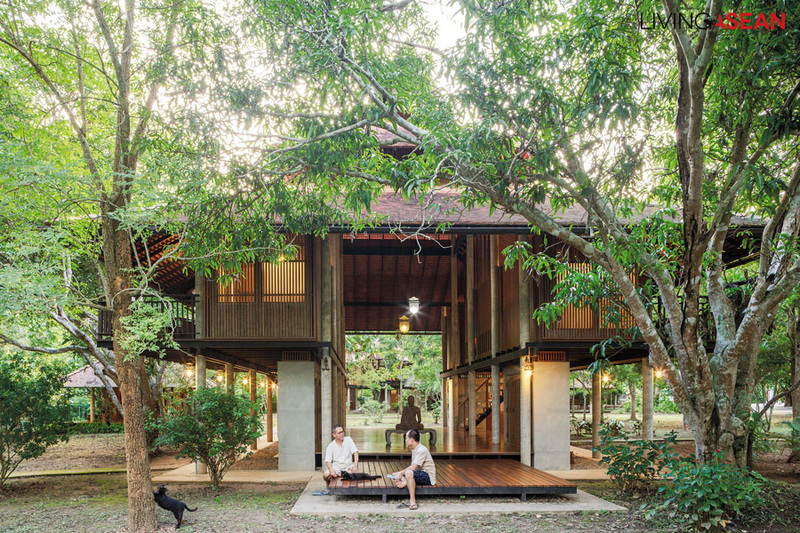 More or less in the center of the complex is sala tham (dharma hall), a place to socialize, with a shady multipurpose yard for activities such as dharma seminars and trainings in woven fabric design, for a local village weaving group, and in natural soap production. There is also a shrine with a wooden Buddha here. Both wings of the second floor hold guest rooms for close friends. 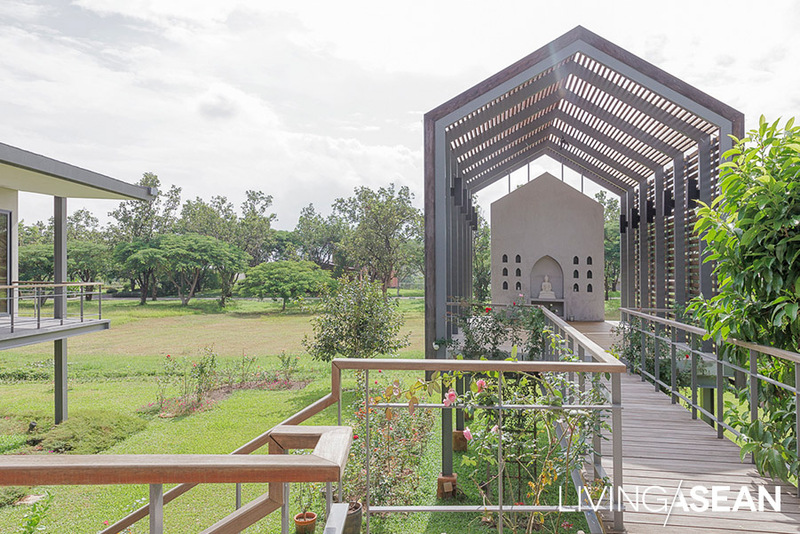 On the southwest side is ruean luang pho (holy man house), a retreat for family members which serves as a monk’s hut when a revered spiritual teacher is invited to the home. 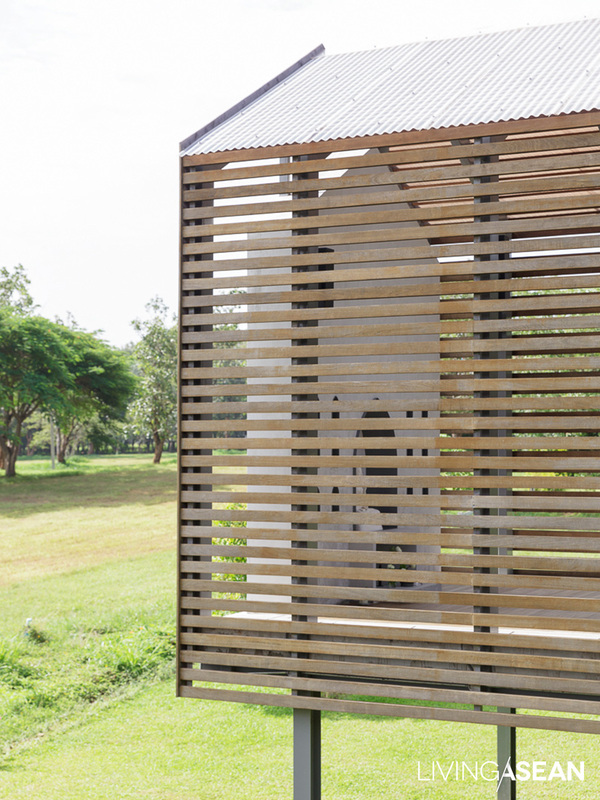 Finally, to the south are akhan kep pha (fabric storehouse) and ruean ngan (workshop) for design work, with different rooms for specialists in different crafts. 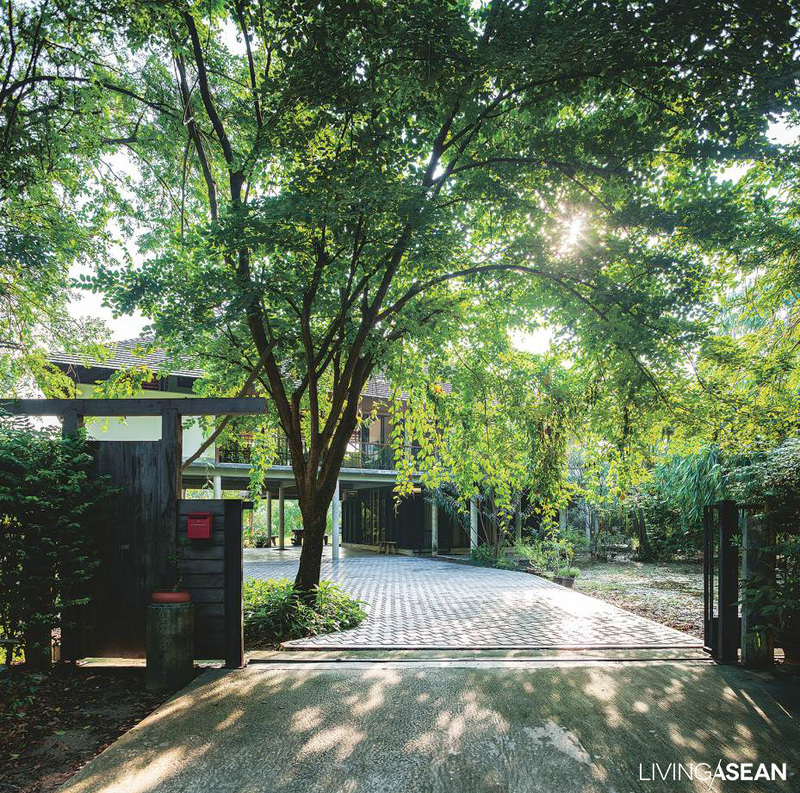 Huean Tham’s outstanding attributes were conceived by Arsomsilp Community and Environmental Architect with the aim of combining good features of the traditional Thai house with functional Japanese concepts. Entering ruean yai we see the floor is raised a bit: this is to protect against ground moisture. 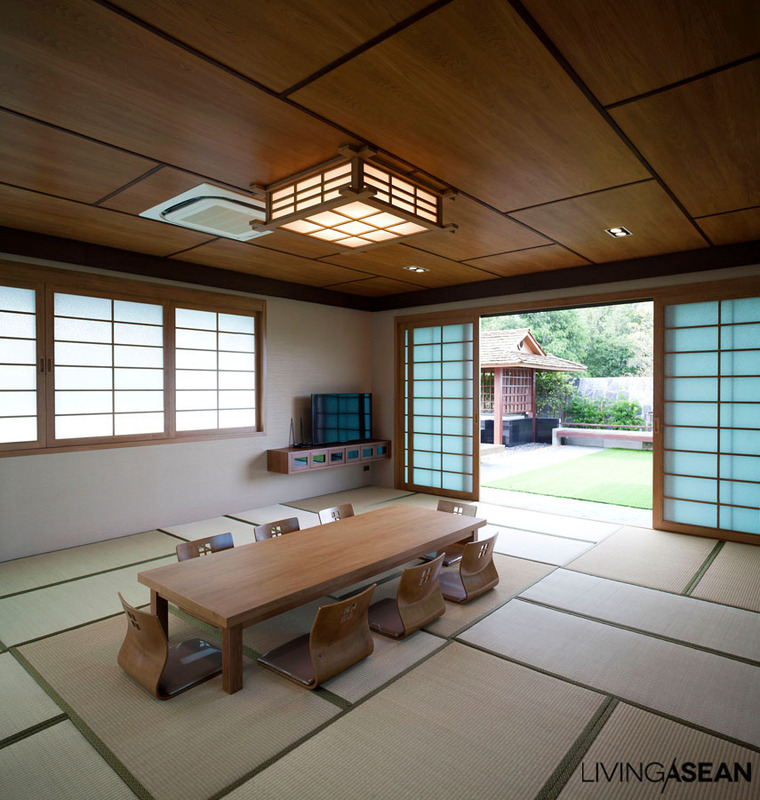 Thai and Japanese homes share a characteristic utilization of the area beneath the main house for guest reception and dining, a multipurpose space called “tai thun” in Thai. 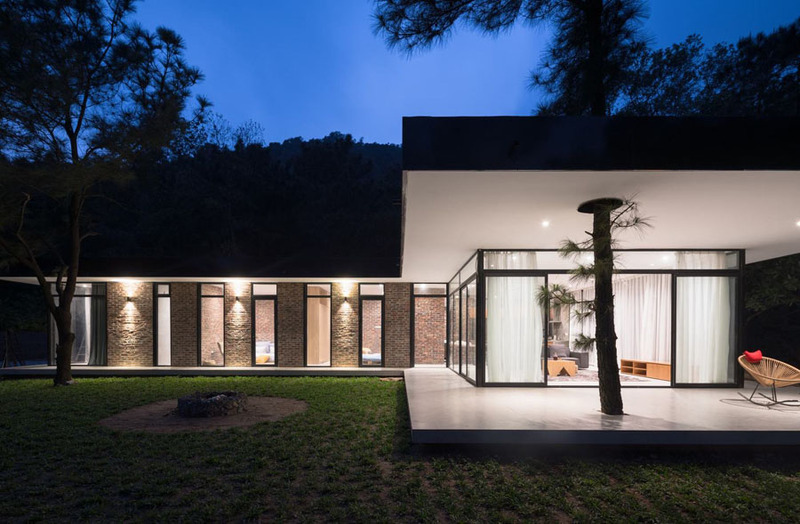 Construction materials were selected for their good points and their suitability: the house is constructed primarily of wood, the house frame primarily of concrete and steel. 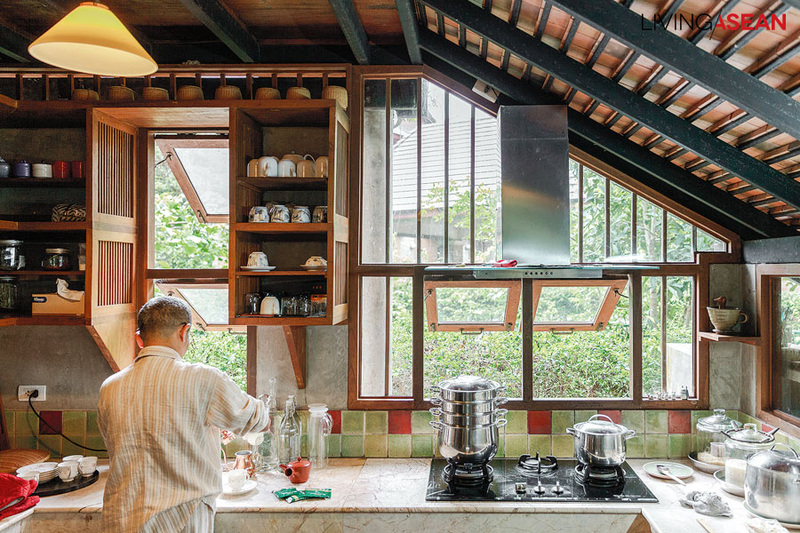 The architecture of Huean Tham isn’t flashy or showy. 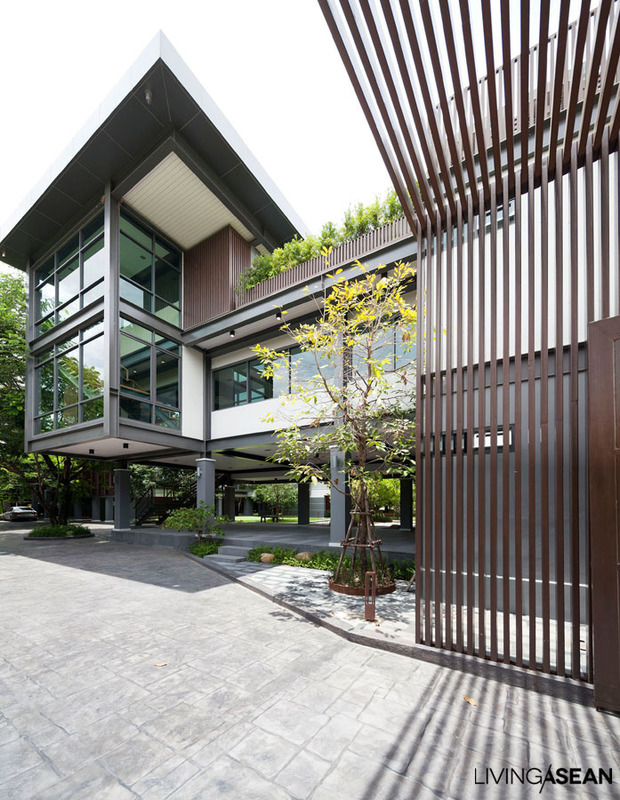 The true beauty of this home is in its fusion of architecture with life toward a oneness with nature and the ways of tranquility, raising the level of excellence for both the architectural team and for Eung and Ussa’s lifestyle. 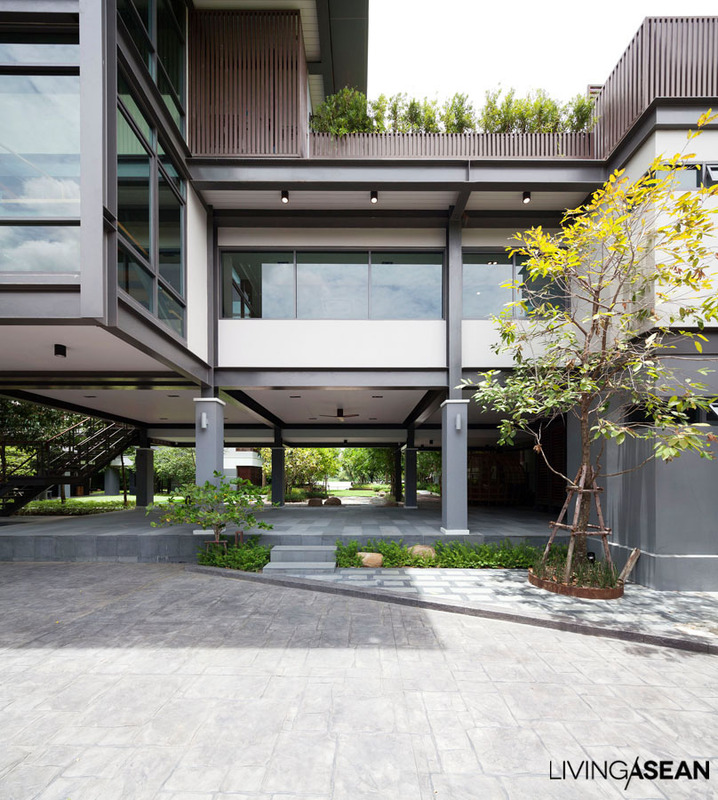 This excellence will continuously reinforce the beauty of this home as time goes on. 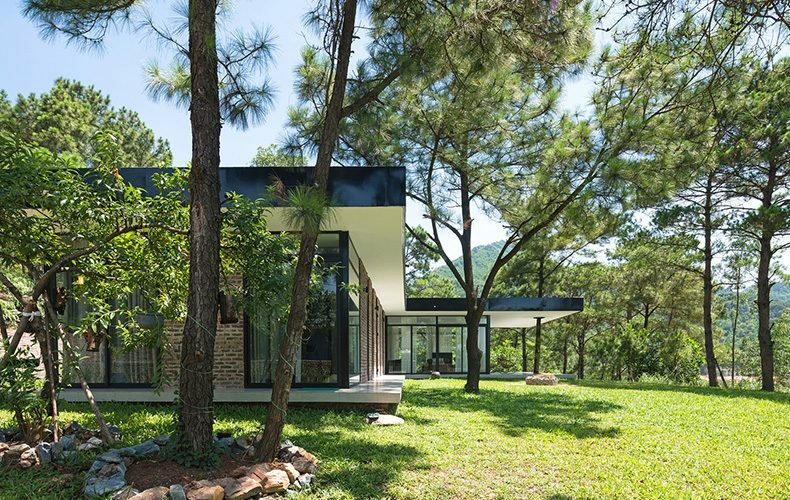 This modern house nestled in pine-forested hills is surrounded by green grass and tree-studded scenery that provides privacy and accents its harmony with the natural setting. 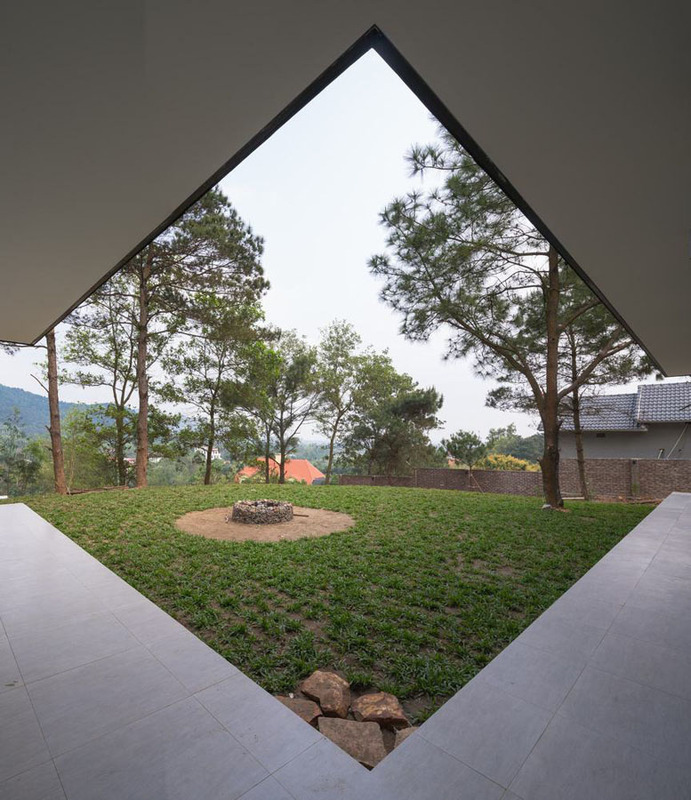 This house was designed by a Vietnamese team from Idee Architects whose priorities involved respecting the former environment instead of leveling the hill and responding to the simplicity of the owner’s lifestyle. 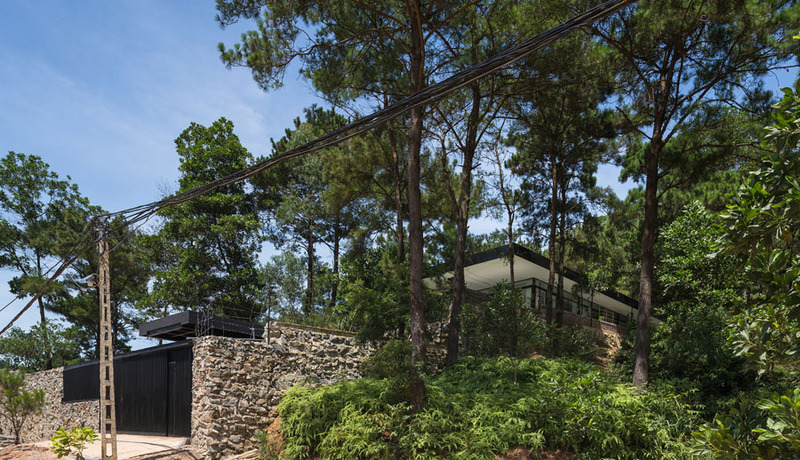 This they managed with an “open space” concept in a home full of modern conveniences that still stays close to nature, washed in the sunlight that streams in through the pine woods. 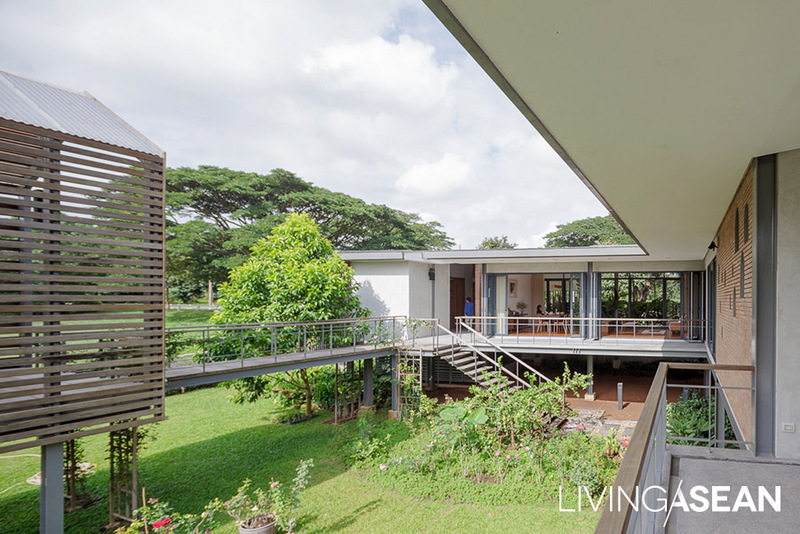 The house is built on two levels, the lower section holding a carport/garage and multipurpose room, and the upper level with living room, kitchen, and four bedrooms set atop a piney hill with a magnificent view on three sides. 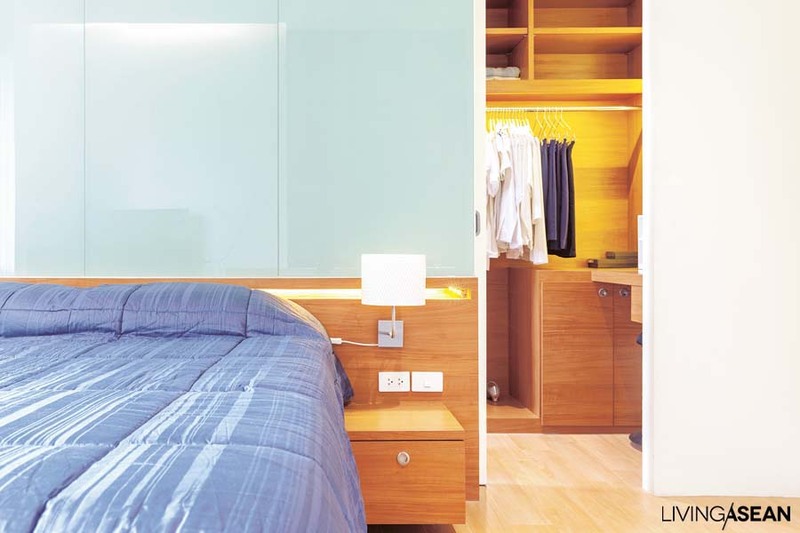 Interior colors are dominated by natural-looking mid-tone colors: whites, blacks, greys, browns, conveying natural warmth and tranquility. 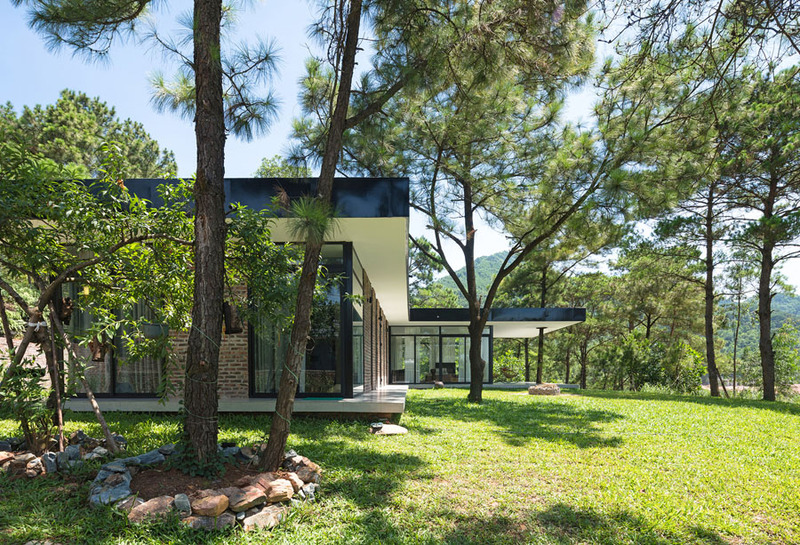 The “focus and flow” design creates points of interest with a play of straight, horizontal, and vertical lines laid against the curves of the drive. 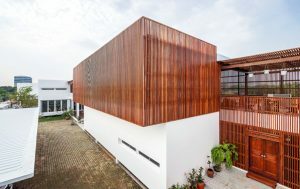 Three-meter eaves project out from the house to offer increased protection from Vietnam’s heavy rain and bright sunlight. 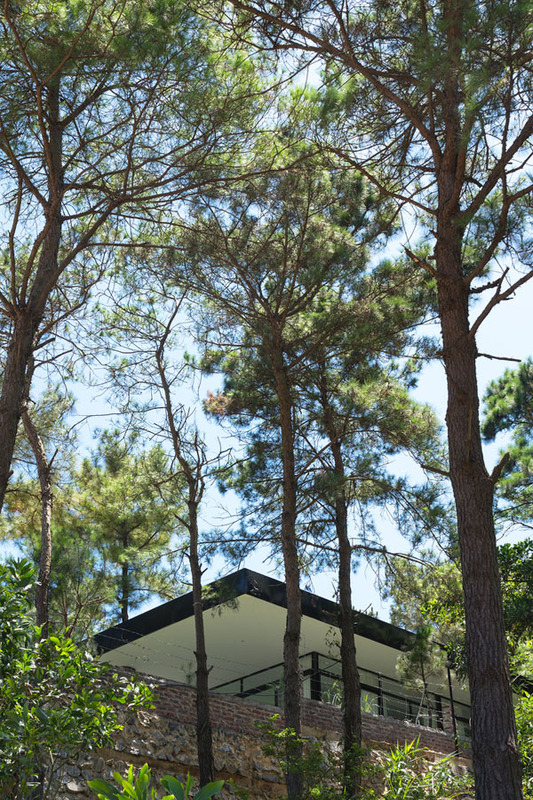 The house is designed in the shape of a slightly unbalanced “T” with a “semi-outdoor” pathway reaching all around. 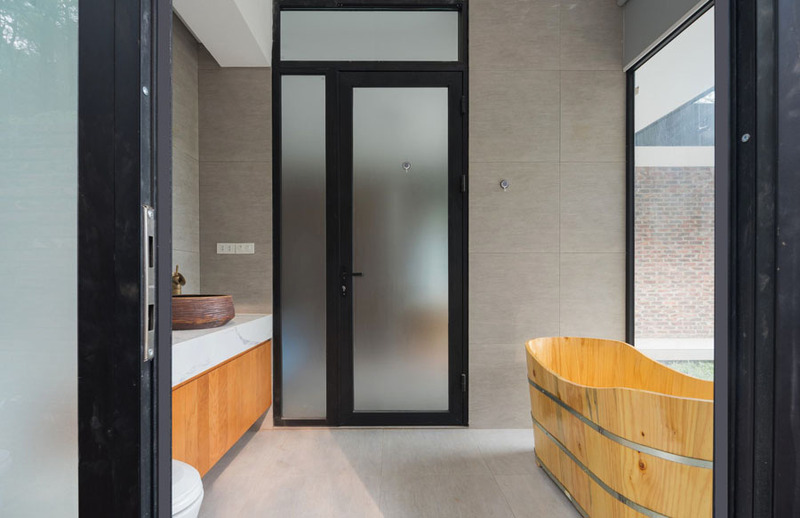 Except for the outdoor shower belonging to the master bedroom, on good-weather days doors and windows on every side of the house can be opened to let the air flow through. 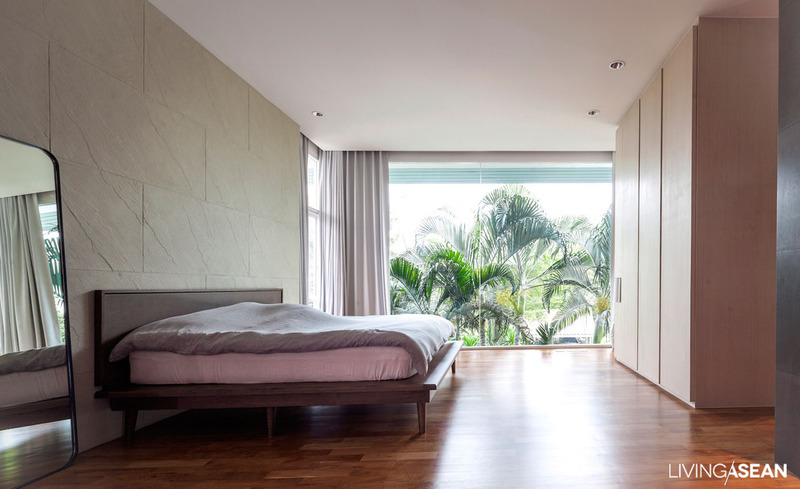 A corridor on the west side acts as heat insulation for the bedroom, an elegant simplicity in design that creates balance between static and dynamic elements in the house. 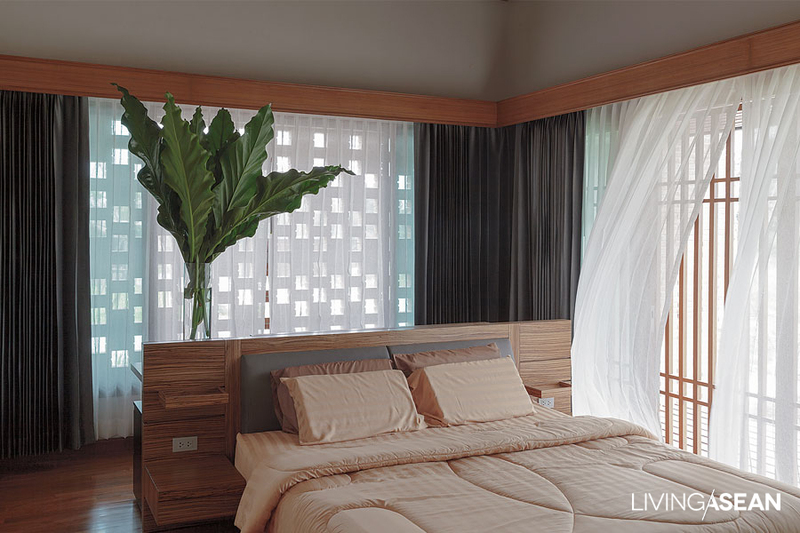 The bedroom’s spaciousness shows dynamism, with the static element expressed through its privacy and sense of peace and quiet. 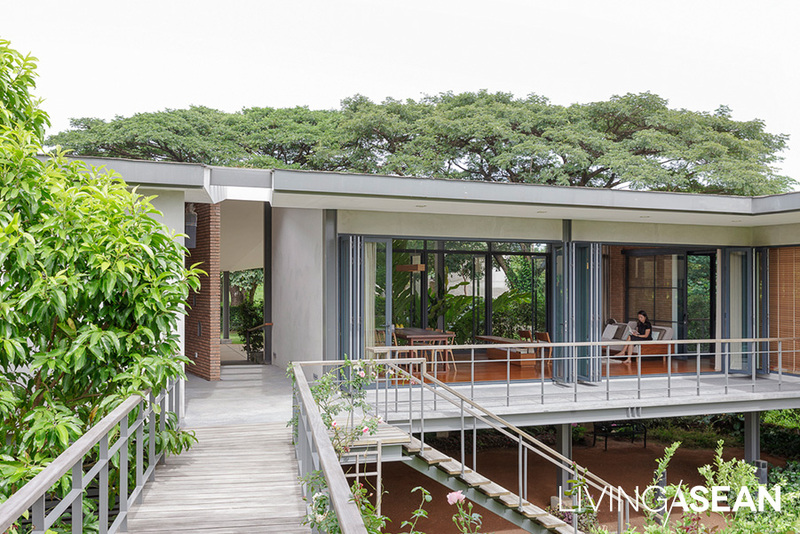 The house is securely tucked away in greenery, as the building was actually designed to blend in with the trees that were already present. The big grass lawn out in front of the living room and bedrooms provides a great playground for the kids without blocking the idyllic view from inside. 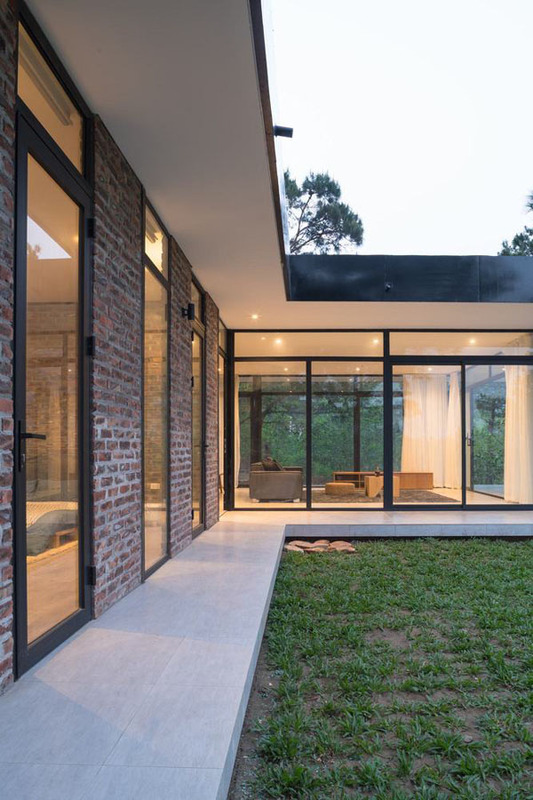 The house structure is primarily of authentic materials like steel, brick, and glass, whose lightness makes for easier adjustments when encountering problems combining them in construction while helping reduce living expenses and minimize negative effects on the original land. 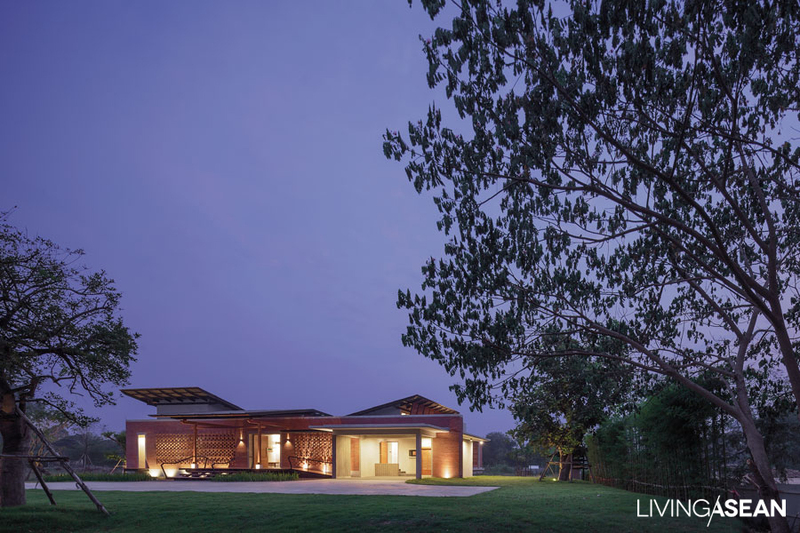 Future energy use is optimized with the wide roof’s facilitation of solar energy storage as well as through clean water and the cultivation of vegetables, all of which truly support a comfortable and relaxing lifestyle. 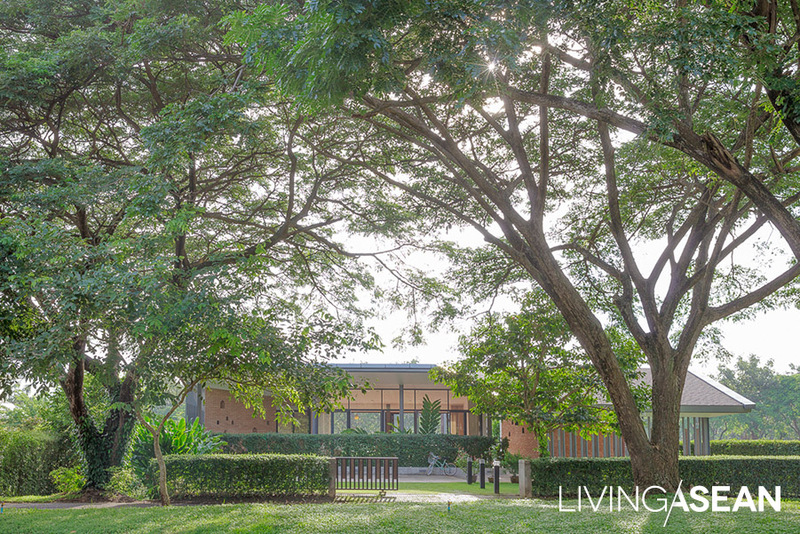 This home rises above a tall tai thun open space perfect for socializing, especially for large family gatherings. And it has some surprises inside. 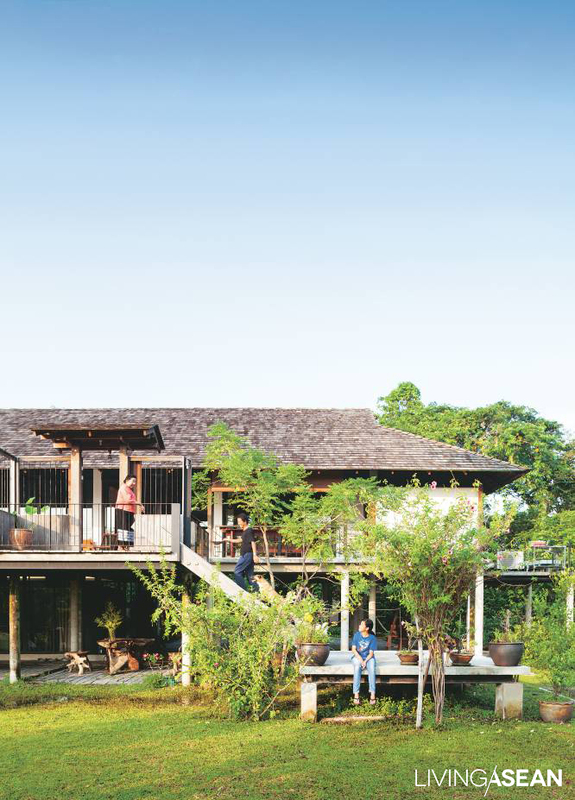 There was already a residence built here, but it wasn’t designed with the evolving needs of such a big family in mind, so a new space was created, a new waterfront home where everyone could come together and guests could spend the night. 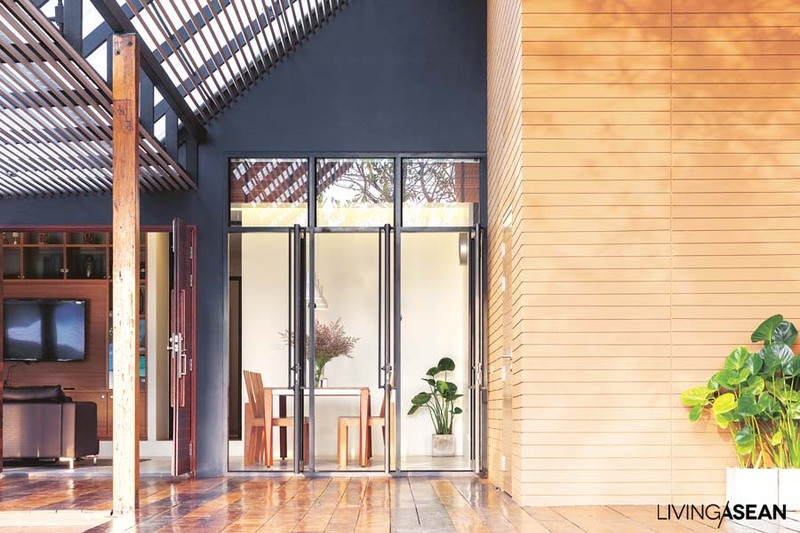 The steel used for columns, beams, stairs, and balconies is surplus material from a large construction business belonging to the owner himself. 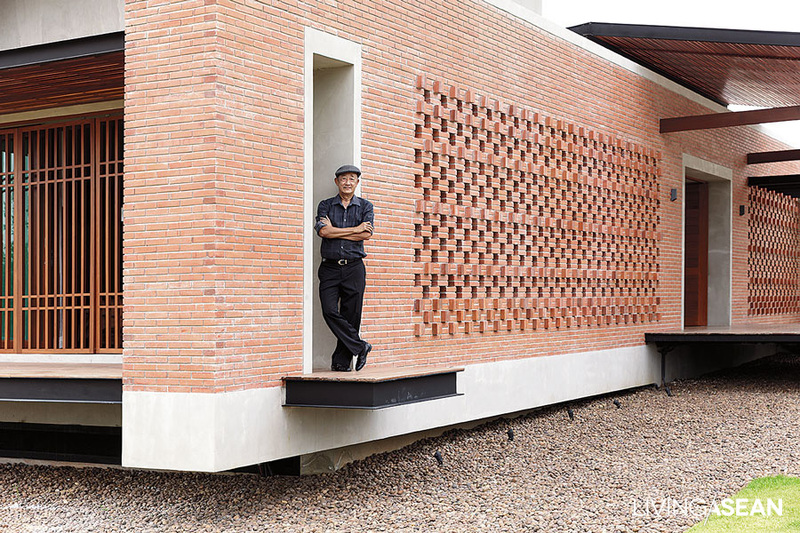 “I had to scale the entire house to fit all that material,” said architect Kasin Sonsri, of Volume Matrix Studio as he spoke about the design challenges. 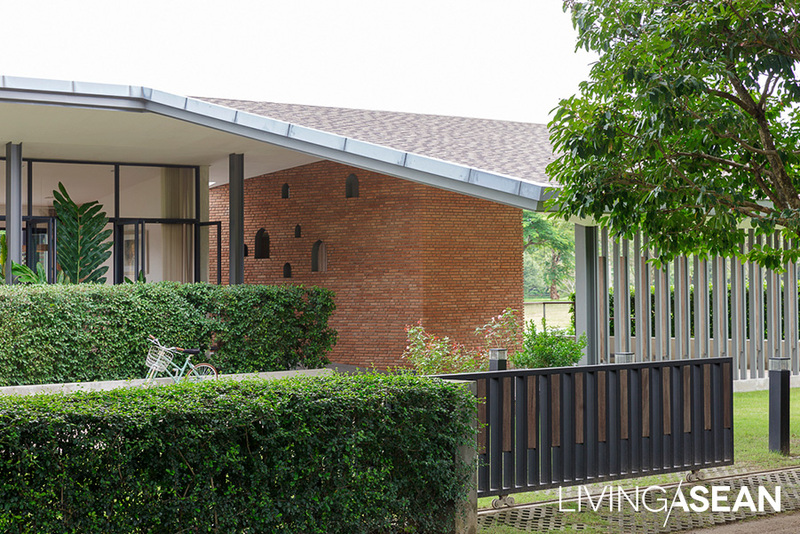 This Ayutthaya home is put together to give the feel of a traditional Thai house, with its high tai thun to use as a multi-purpose courtyard, broad eaves reaching out, living area open and inviting to the outside breeze, house raised up to catch views of the river and the garden below. 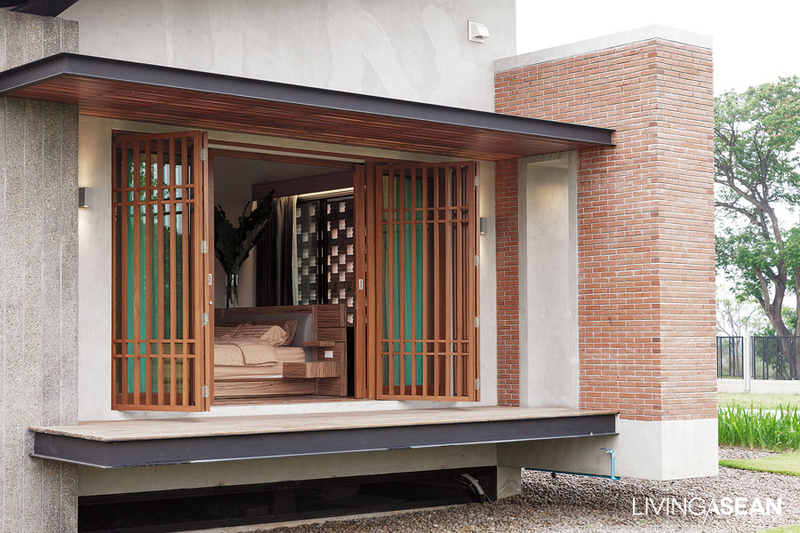 There’s a wide porch, an add-on extending out from the big house. 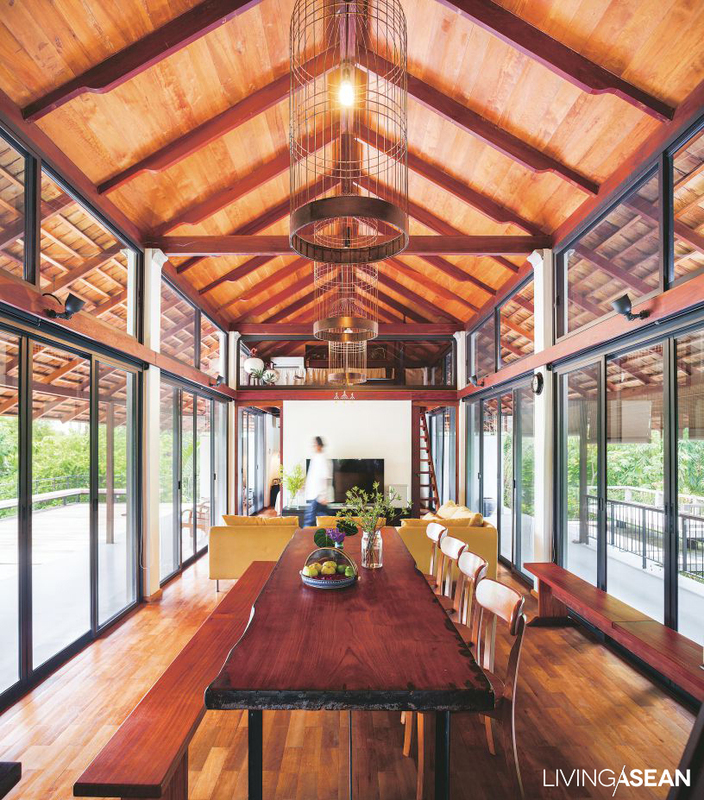 Massive posts and beams are designed to showcase their structural utility as a part of the house, as do the steps up into the dining room, the walkways, the outside porch, and the rain gutters spilling water through a steel grate. 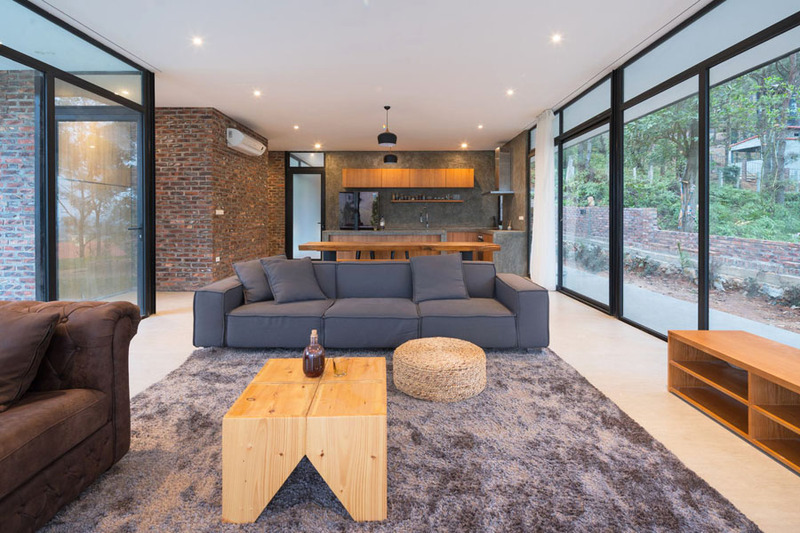 All these elements combine to give a unique contemporary look to this house of steel and wood. 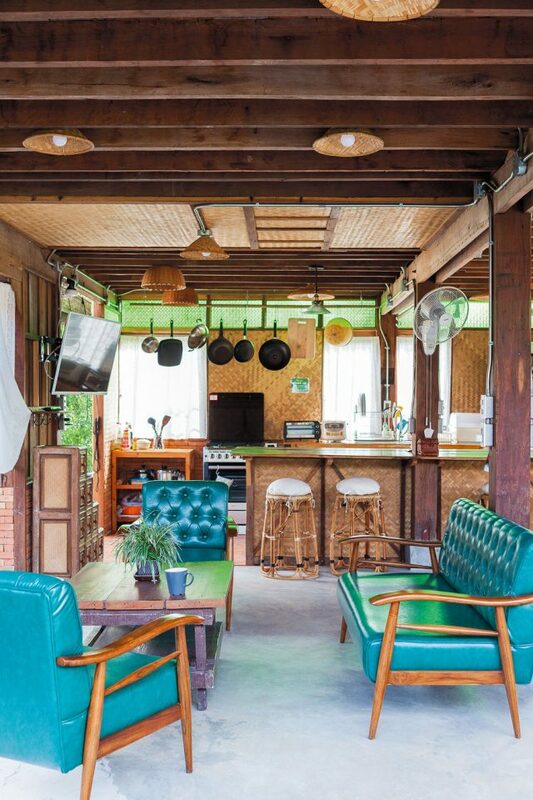 The interior décor is simple. 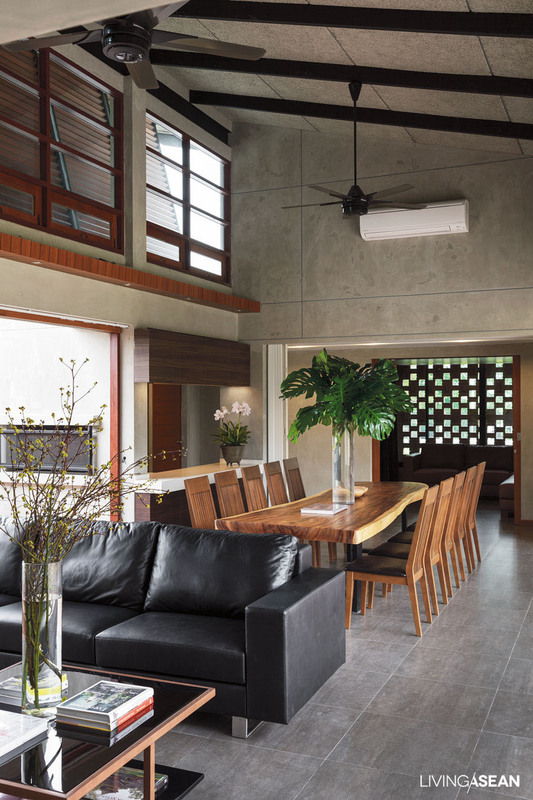 The second floor features an “open plan” separation of usable space: walls open up, reaching through from the kitchen into a large dining nook and from there into the living room area. Step up onto the third floor, and surprise! 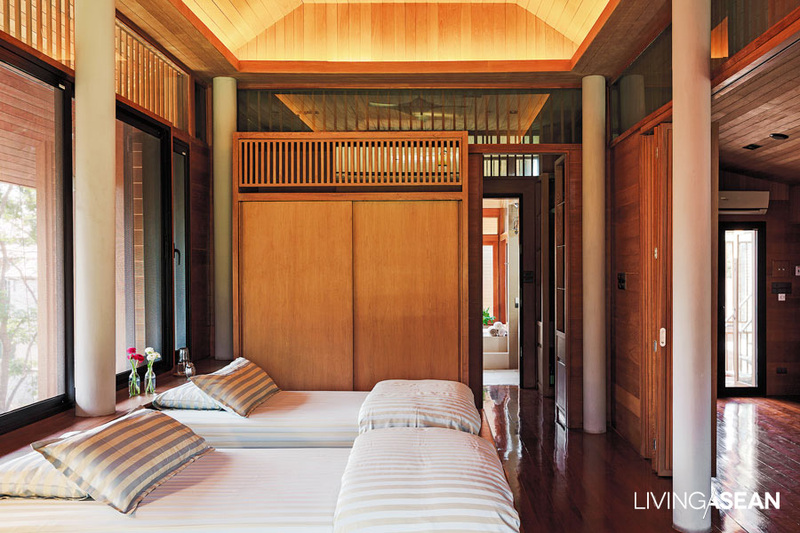 The décor completely changes and it’s as if you’ve suddenly dropped into a Japanese home, where the style of mats, windows, and doors all tell you why the owner named the house “Sala Zen.” In this room is a built-in cabinet where bedding is stored so that guests can easily come spend the night. 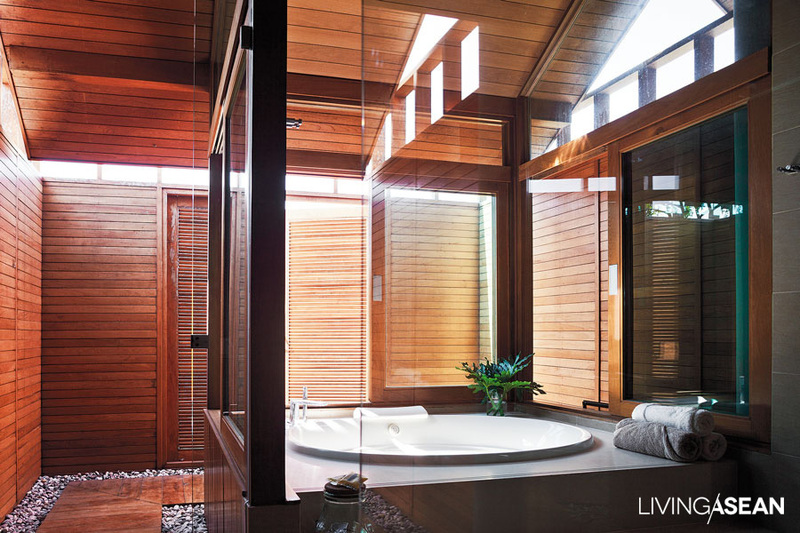 Outside is a roof deck garden highlighted by an Onsen hot tub in an outdoor private spot that can’t be seen from the garden below. 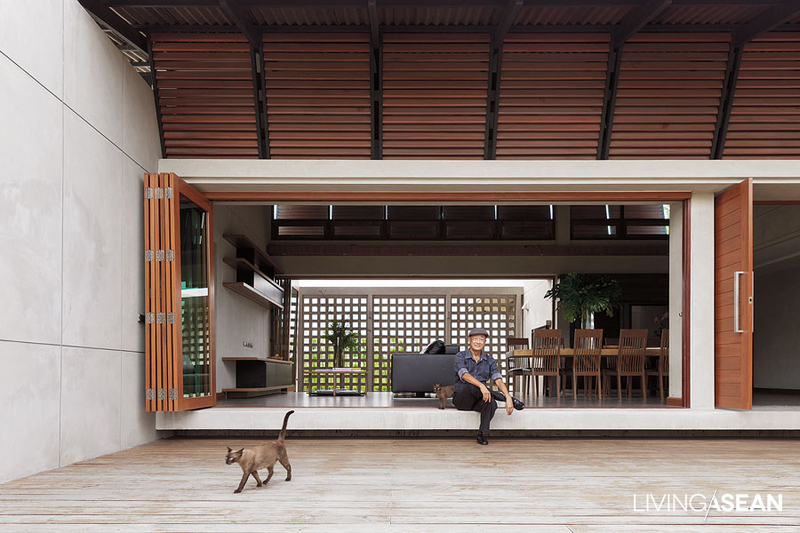 This home is composed of many elements, but they all blend to make this a truly Thai residence, a steel-framed waterfront house that’s warm and familial, fits perfectly into its context, and offers the experience of comfortable living with natural light and breezes and great views all around, on this small Ko Rian soi in Ayutthaya Province. 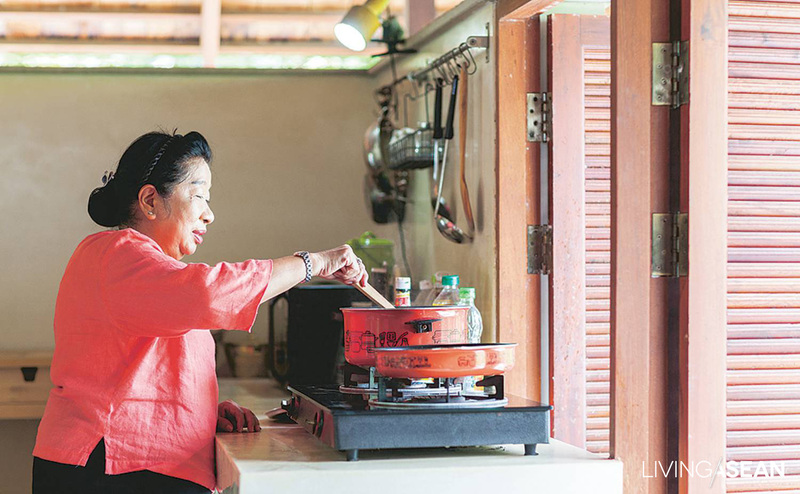 Right in the middle of a field in Ang Thong Province stands a single-storey house that has become a community point of interest, built with his own cash by a 73-year-old youngster. 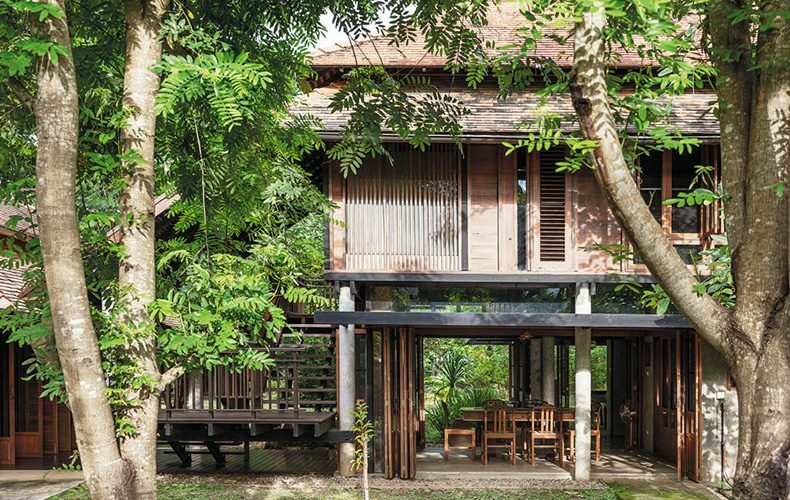 Standing in a rural field with a road in front, the house opens out on a rubber tree orchard in the rear. 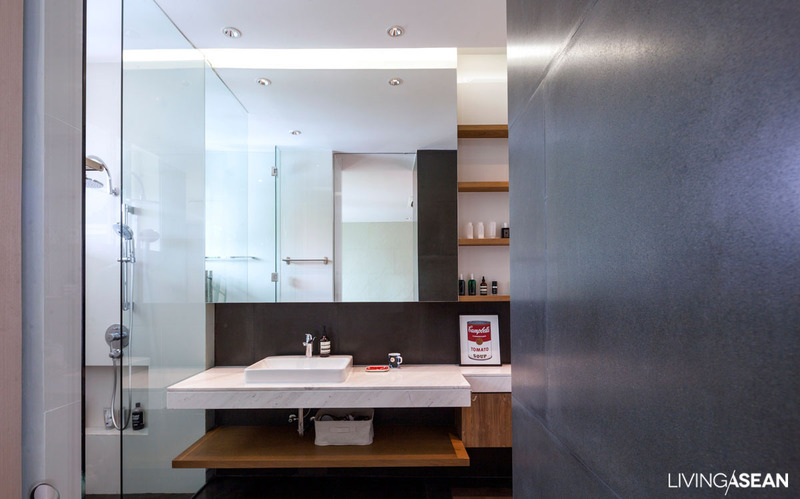 Simplicity is the foundation of the design: a balance between vertical and horizontal lines and surfaces, no nooks or ridges to collect dust, and elemental materials such as concrete, wood, metal, brick, and gravel. 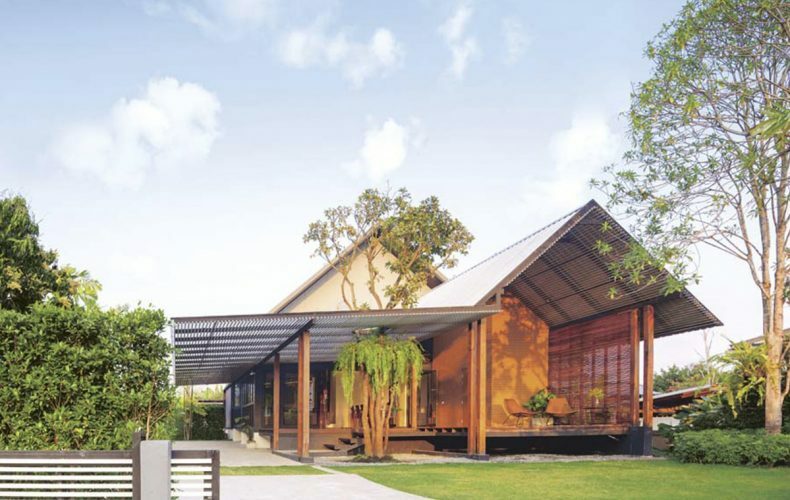 A metal frame lifts the roof at an angle to break the force of the wind. The floor is raised above the ground, facilitating maintenance work on utility systems beneath. 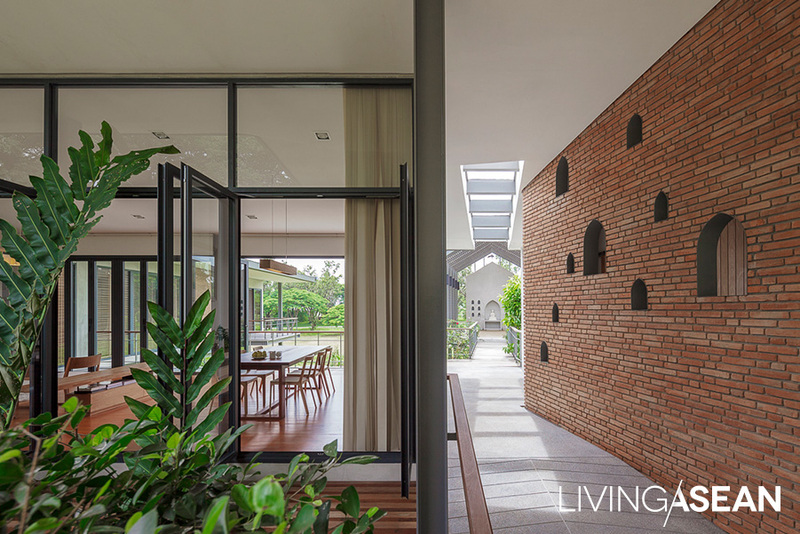 The front wall is a striking display of BPK brick, a local Ang Thong material, laid in a unique arrangement to create beautiful patterns of light and shade, with an additional layer of sliding glass windows for safety. Around the house is laid a path of river gravel, so someone in the house can easily hear a person walking outside. 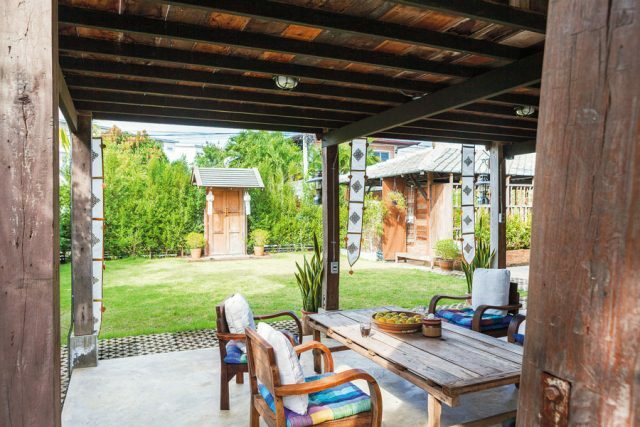 The big central living room is a great place to relax, but the real heart of the house is the big porch. 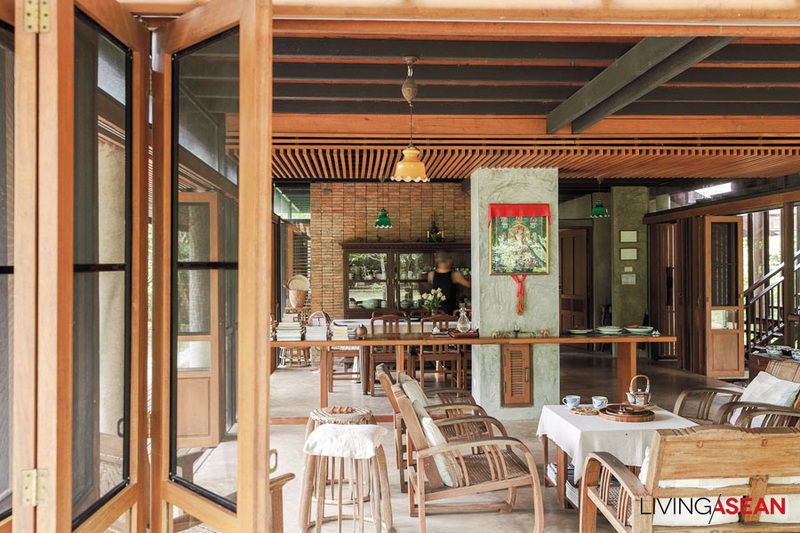 When the folding doors are opened, the room opens up, and it’s much like an old-time Thai house, with the added benefit of a great view of the gorgeous rubber forest, just as the original design envisioned. 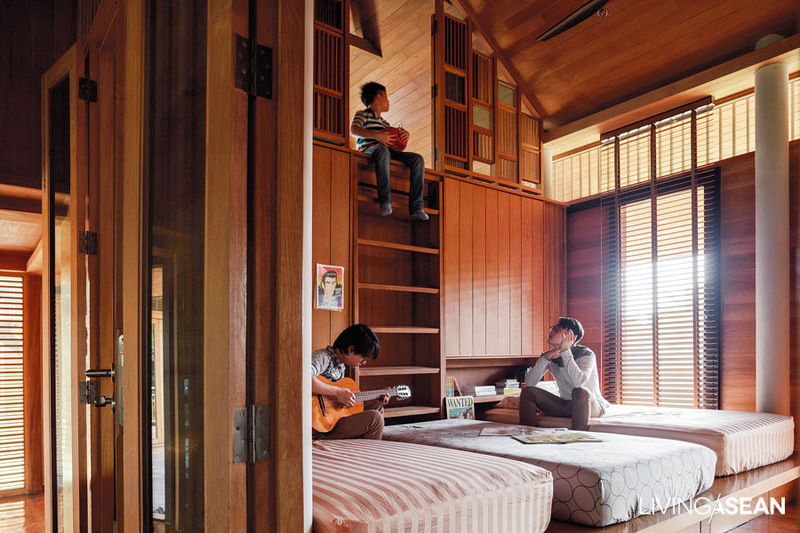 These rooms are like a house within a house: they were once just a 90-square-meter bedroom on the second floor. 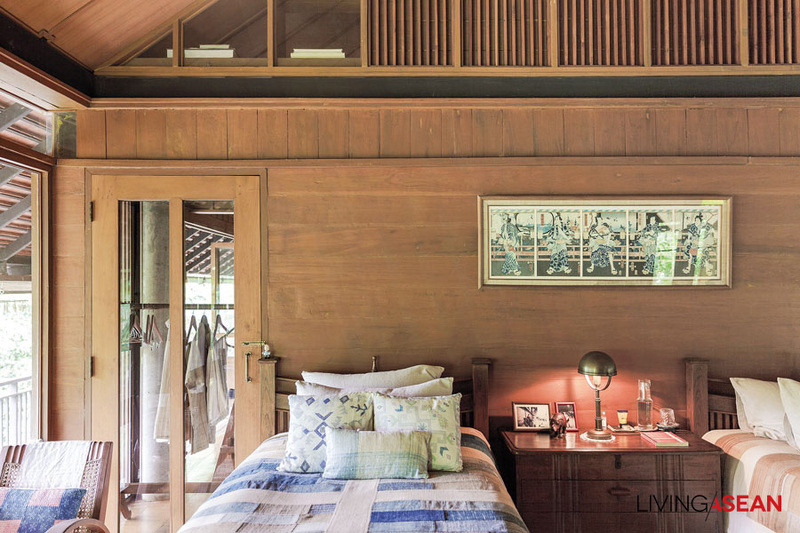 Starting life as a married couple, lovebirds Sitthidej Chirapanda and Nicha Pongstaporn took on the challenge of renovating Sitthidej’s sister’s old bedroom. 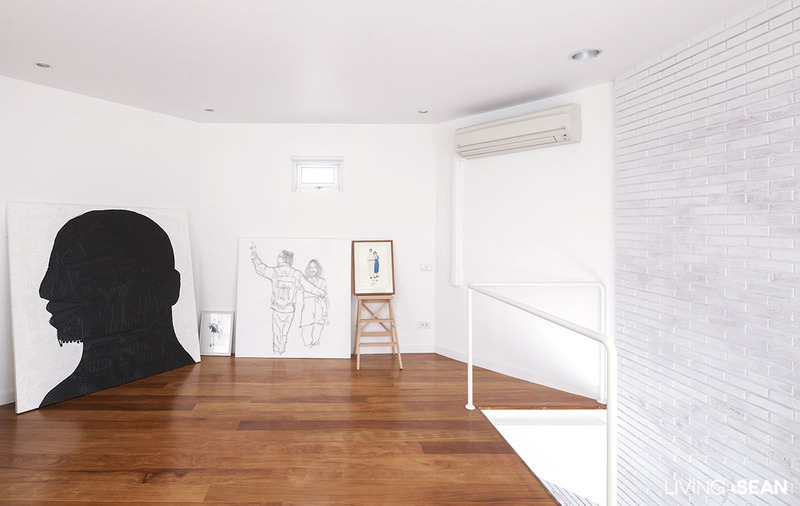 After dividing a second-floor usable space of 70 square meters into living room and bedroom, they added in the 20-square-meter octagonal loft to create an art gallery. Architects from Fatt! 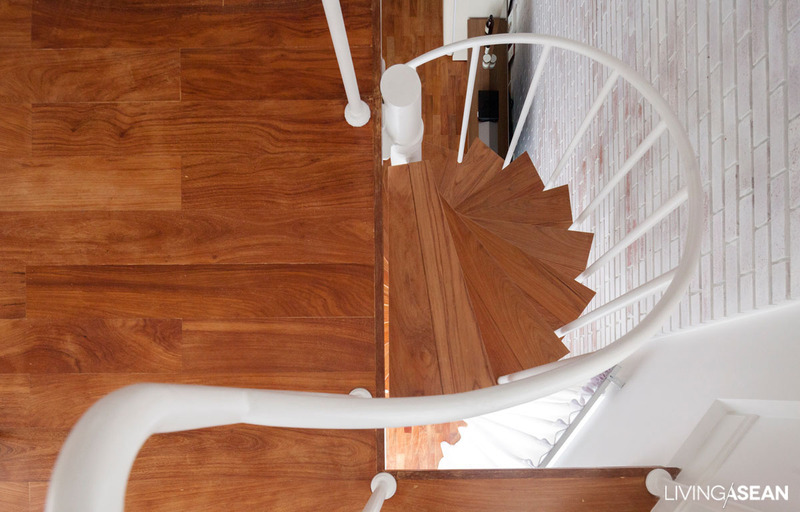 Studio took on the job, and kept the original structure almost intact, but did save space by changing the floating staircase from its original design to a helical (spiral) one, adding an implicit eye-catching point of interest to the space. This required careful measurement to get the proportions right, so tall people wouldn’t hit the ceiling going up. 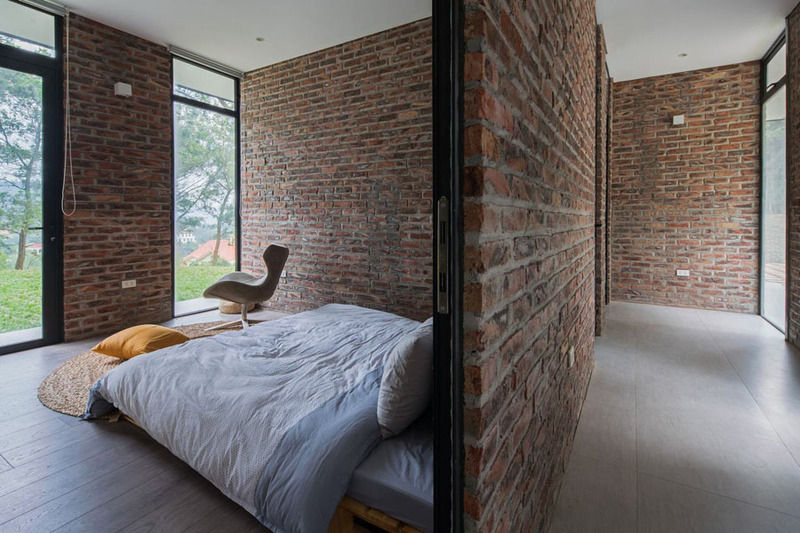 Here, too, the meticulous, painstaking work of master craftsmen was employed in creating a finely detailed brick wall. After a first coat of plain white paint they daubed, trimmed, and polished the bricks in different spots piece by piece to create the sort of unique patterning the residents were looking for. 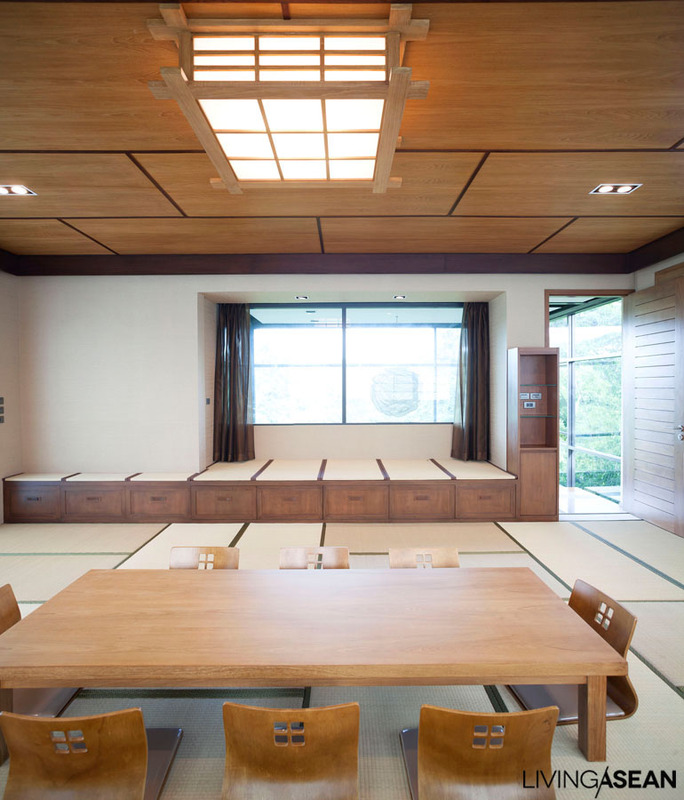 The architects retained the original makha wood floor, carefully abrading the wood to soften it, then surfacing it with a round of oil-based finisher. 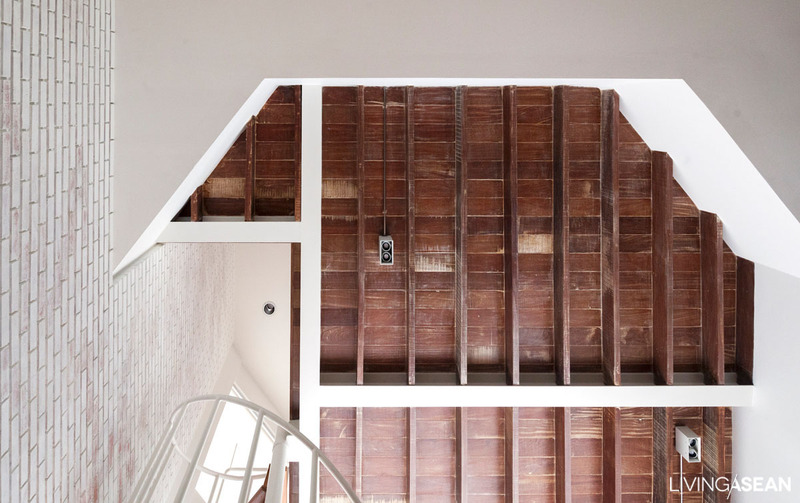 It was decided to completely remove the original living room ceiling so as to open the space up much more. 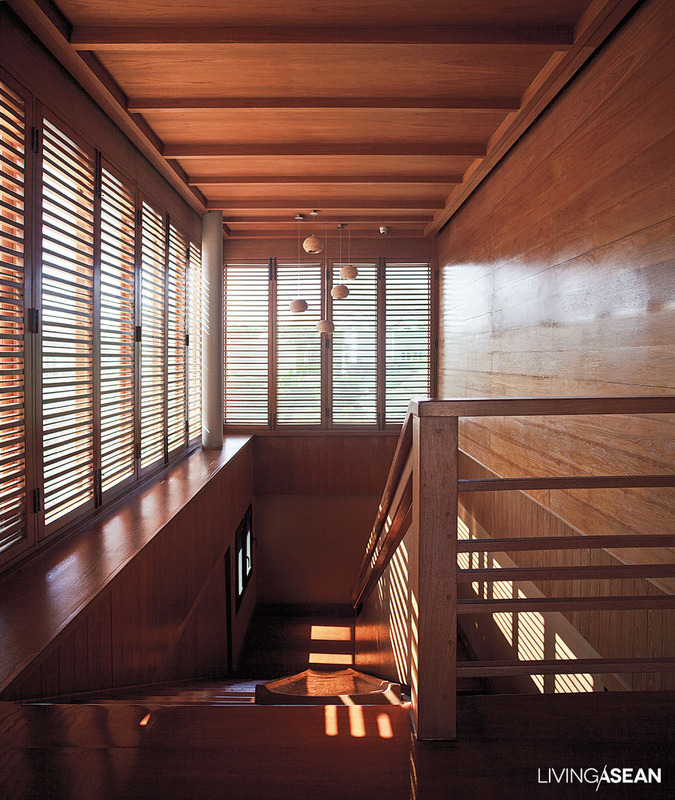 A ceiling-specific demolition method was used, enabling display of the bare surface of the red wood above, which was polished, softening colors until the unique grains of each panel showed clearly. 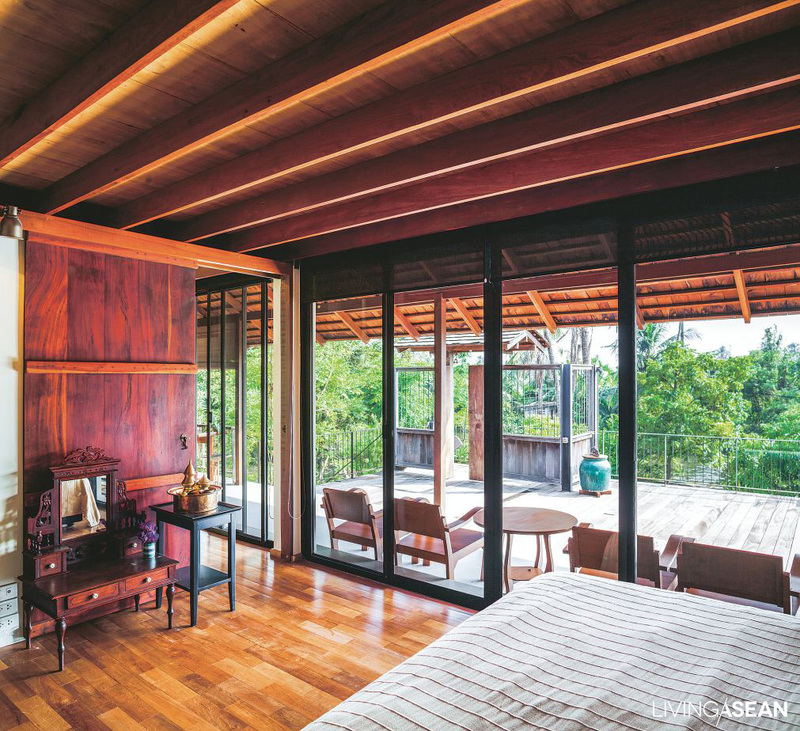 In the octagonal gallery the original window was replaced with a one set with square panes painted white, offsetting the black-paned sliding steel door between living room and bedroom. 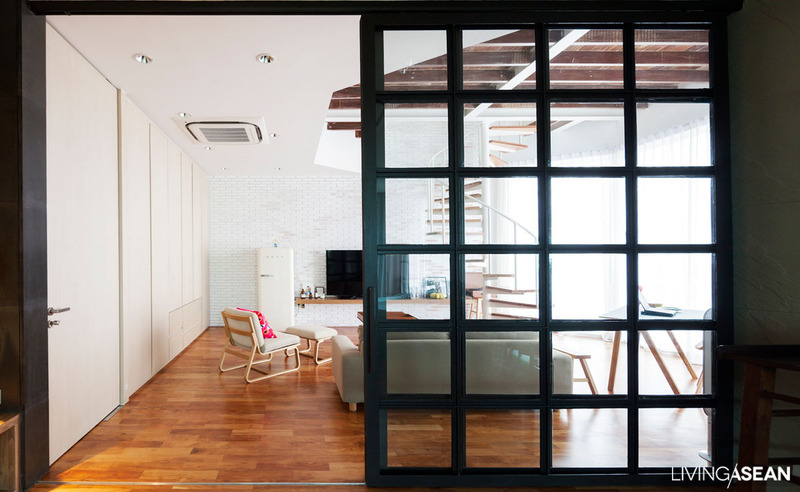 The division of the main floor is quite noticeable, as the colors split it off into two sections: the living room is mainly white, while the bedroom is defined by darker, more austere tones, giving it a quieter, more restful mood. Even on a day when the weather is not all that favorable, the overcast, sunless firmament shading the wall surfaces, the room we’re standing in exudes warmth of other kinds: it’s warm in color and style, and warmed by the smiles of this lovable couple who get to live on and on within this private space they themselves once called the stuff of dreams. 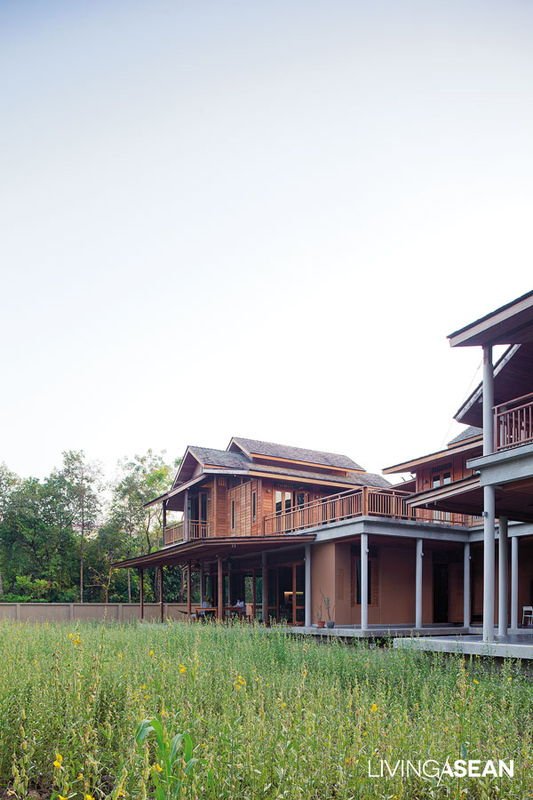 Out of the edge of a sun hemp field rises what looks to be a traditional huean isaan (Northeastern Thai house). 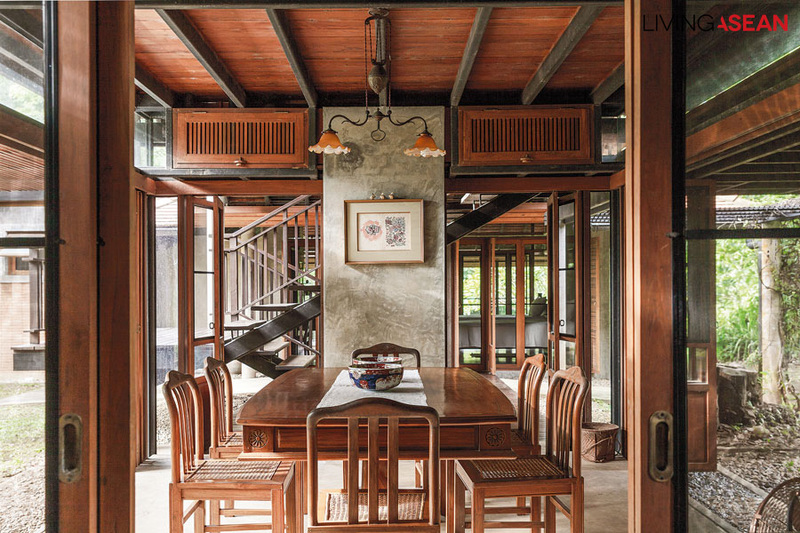 But this home, set in a shady, woodsy atmosphere, fragrant with the aromas of a Thai house and the fun-filled rhythms of Thai family ways, is fully adapted to contemporary ways of life. 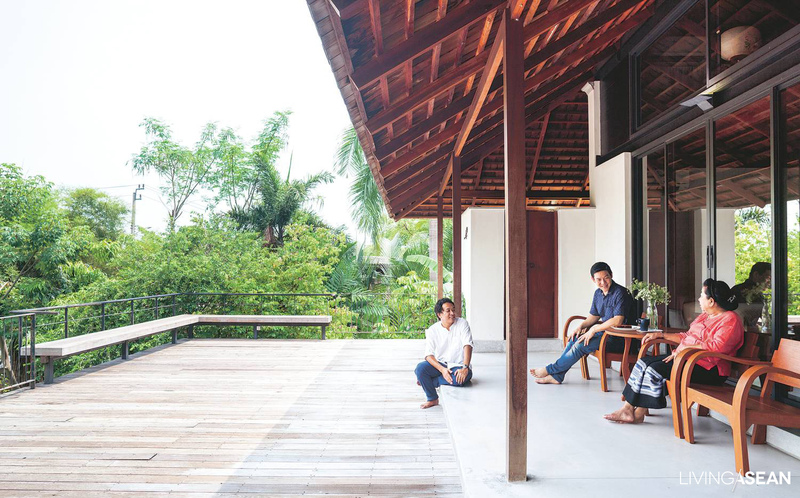 After Sakda and Orapin Sreesangkom had lived 20 years in a condo, they designed this eco-friendly house to find an adaptation of Thai family life that could suit the modern age, and to build environmental awareness in themselves and their children. 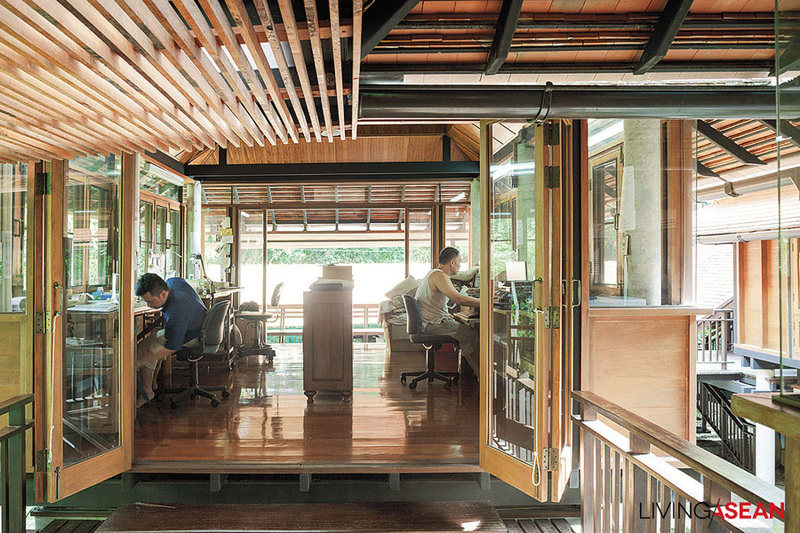 The ground floor design echoes the traditional tai thun lower space found beneath Thai houses. 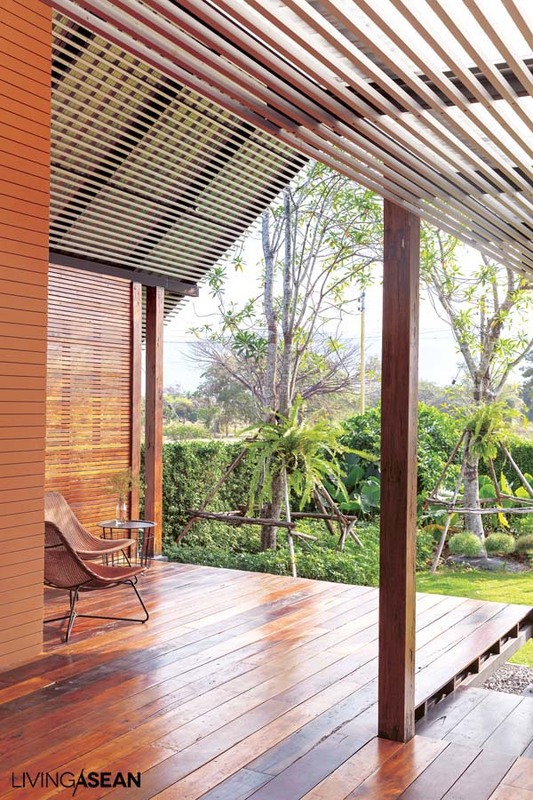 A porch reaches outwards to fill the usual roles: entertaining guests, socializing. 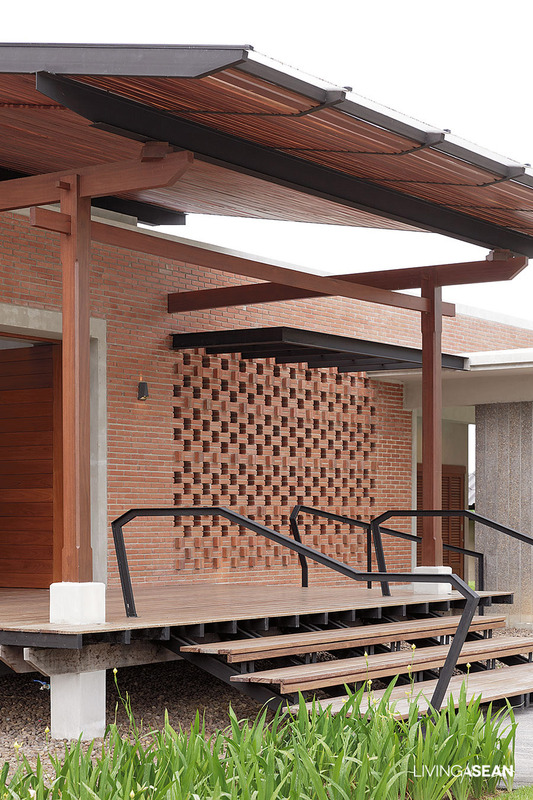 Up close you’ll see it’s more like 3 houses connected by one deck, each one with wide eaves blocking sun and rain, but with a twist: the underside insulation is “rammed earth,” La Terre’s innovative cooling solution that rapidly absorbs and diffuses heat and is made from organic, renewable materials. 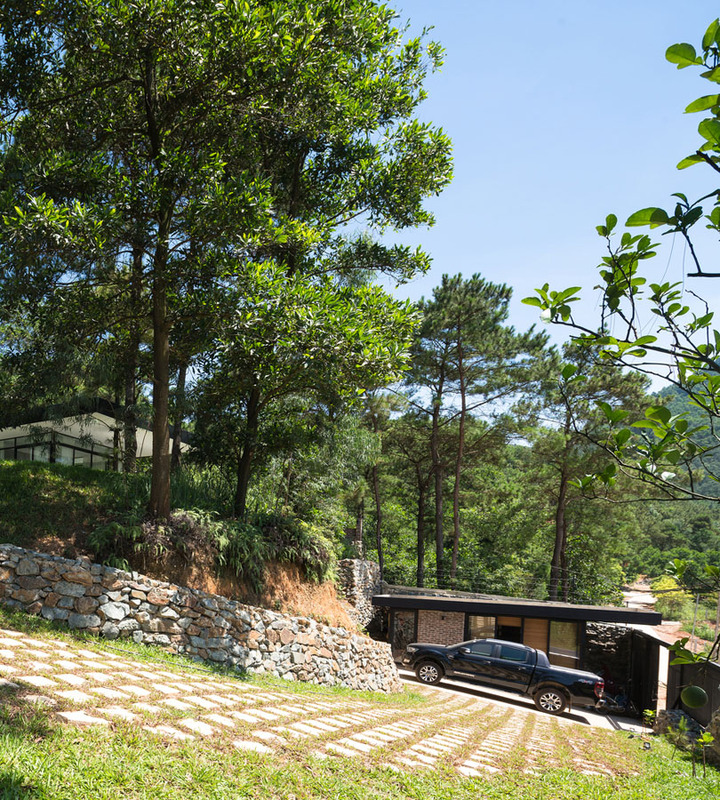 Sakda and designers Arsomsilp Community and Environmental Architects shared the same vision. 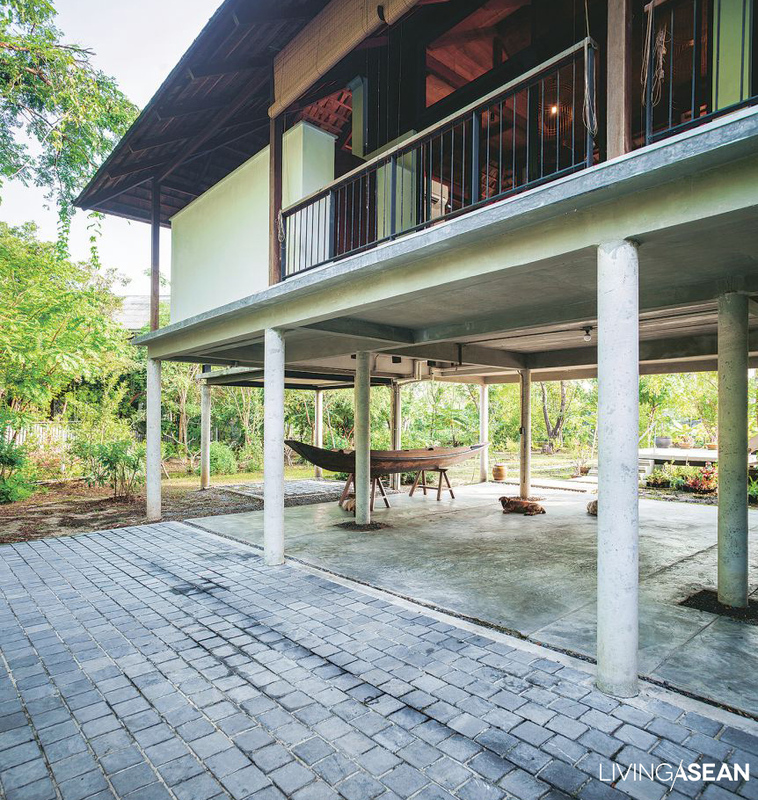 The huean isaan takes over in spirit, though, with its outward image evoking a cultural memory reflected in the playfulness of the three boys, Chris, Gav, and Guy, bringing cheer to every corner of the house: playing in the attic, sliding down polished planks beside the stairway, and everyone’s favorite: the sky deck, accessible from anywhere in the house. 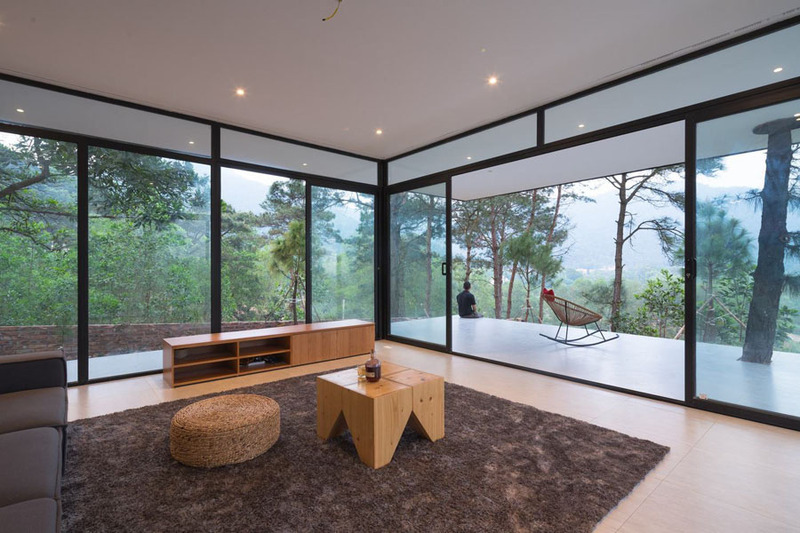 The heart of the home is the living room: it’s spacious, with bar counter, dining area, and sofas for relaxing, sized 7 X 11 meters, and with no support pillars blocking the view within. 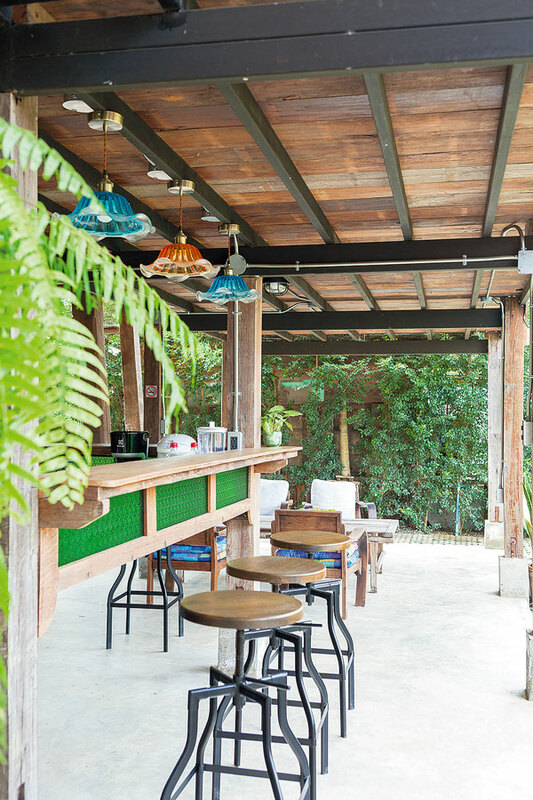 It was designed to mirror the look and function of the tai thun, a space that brings everyone together to do whatever they like to do best, as individuals or a group. The building foundation supports a raised deck all around the house. This keeps slithering things and garden creepy-crawlies from coming into the house, at the same time creating good ventilation below. 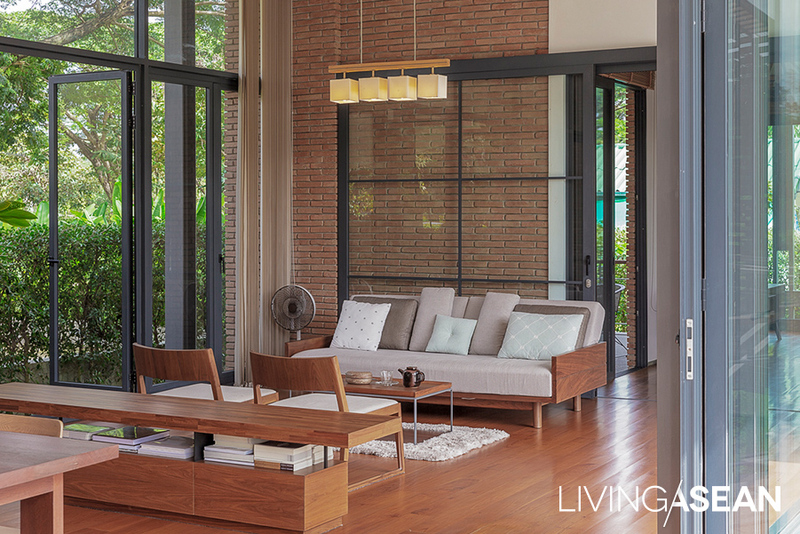 The extra area for sitting, stretching the legs, or walking out into the garden is one more bonus. 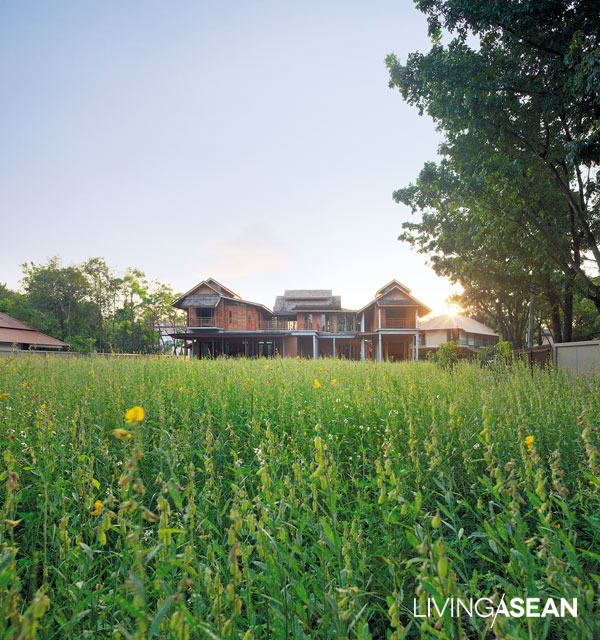 Sakda’s deep attachment to the traditional huean isaan it what brought this all about. 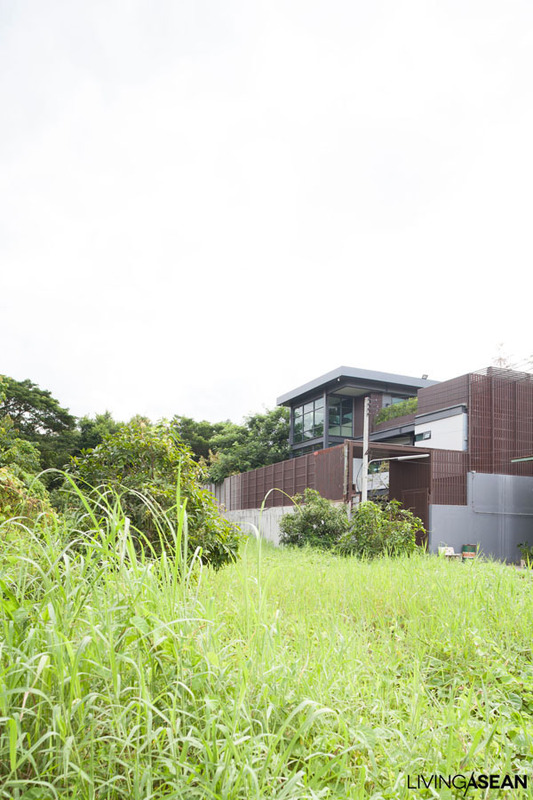 That, and the family’s courage in leaving the convenience of condo life behind them to design, build and live in a completely different way, growing their own garden, and creating a new home that could be passed down to the next generations. 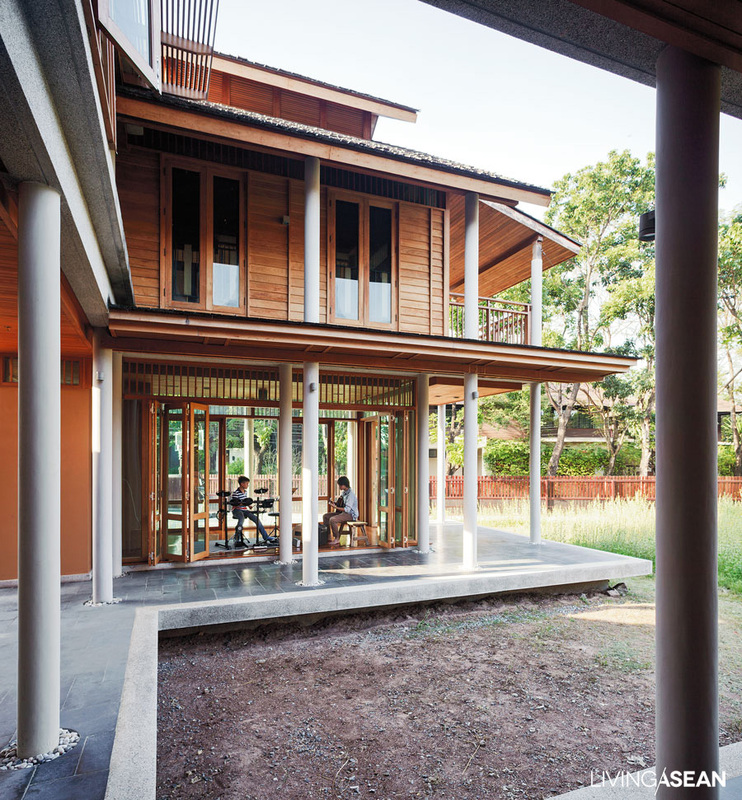 This one-storey wooden house is designed to bring the best of the old Northeast Thailand lifestyle into the modern age. 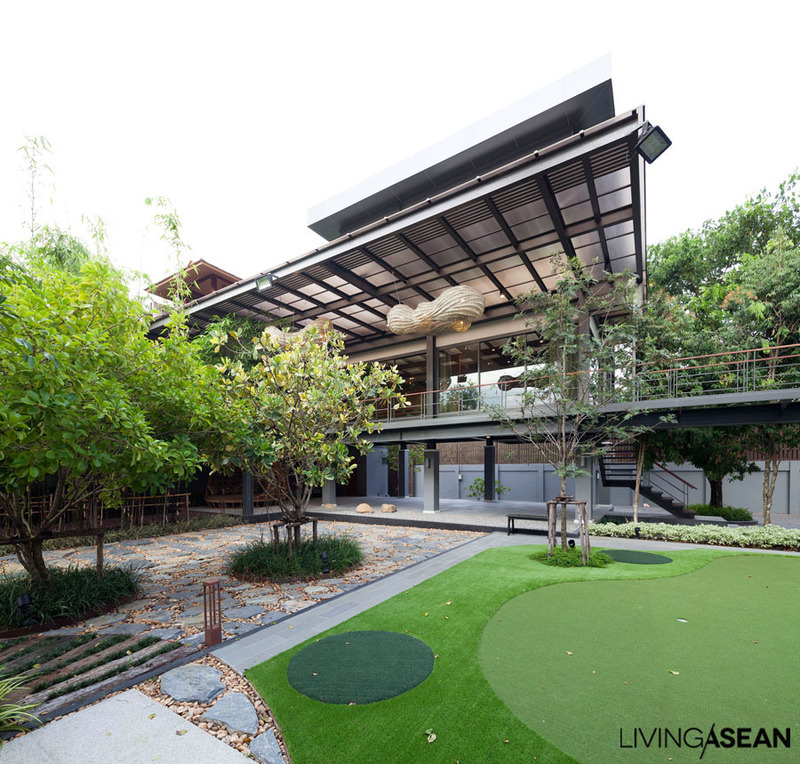 Strikingly contemporary with its high-gabled roofs, it features a spacious adaptation of the traditional Thai house verandah where relatives and neighbors can come together, hang out, and shoot the breeze. 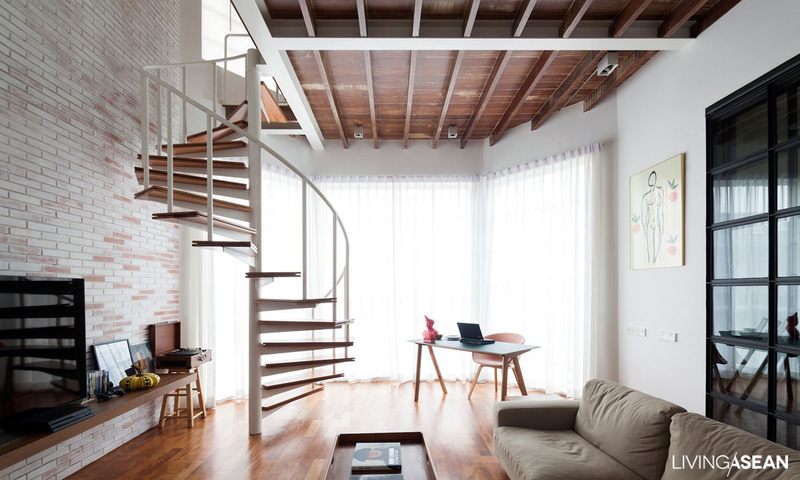 Originally, Wathinee wanted the designers of S Pace Studio simply to renovate the old 2-storey house. whose bottom level had cement flooring, with the upstairs all wood. 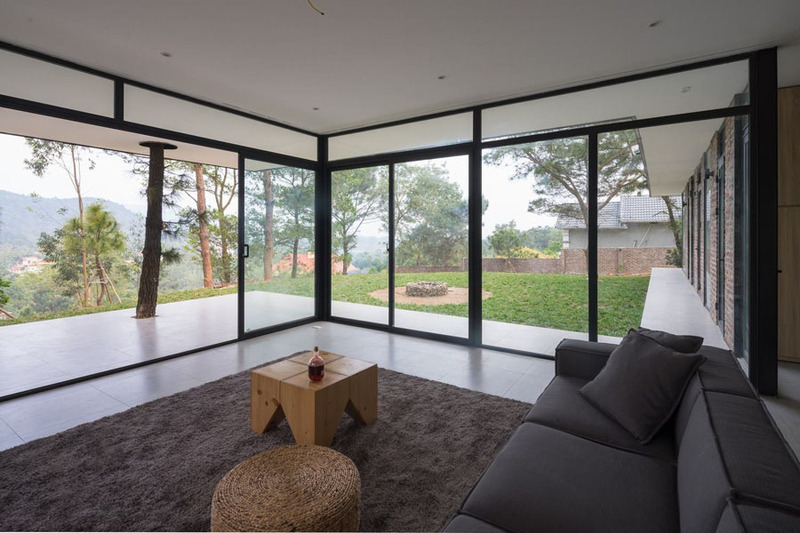 After a full assessment of materials and building frame, though, it became clear that a completely new house was the way to go. The first step was to raise the foundation above road level with landfill, to reduce the risk of flooding. 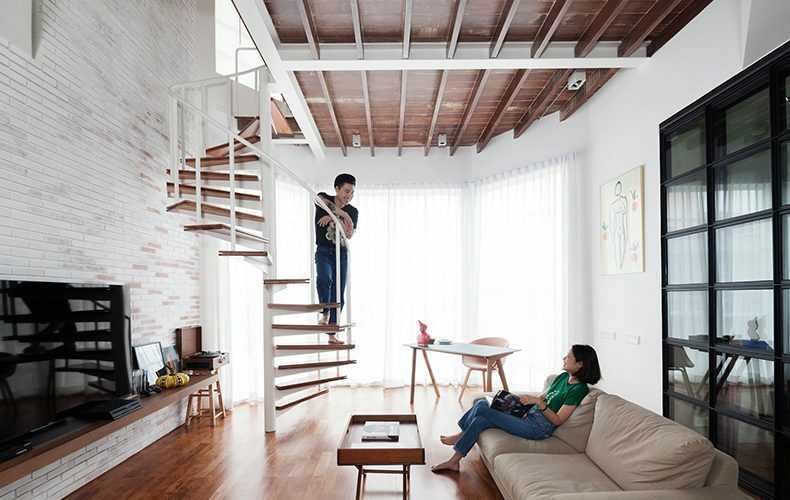 Eventually they took advantage of the large property size to bring all the functionality of the former two storeys into a thoroughly modern single-level house with the added bonus of not requiring an aging grandma to climb stairs anymore. 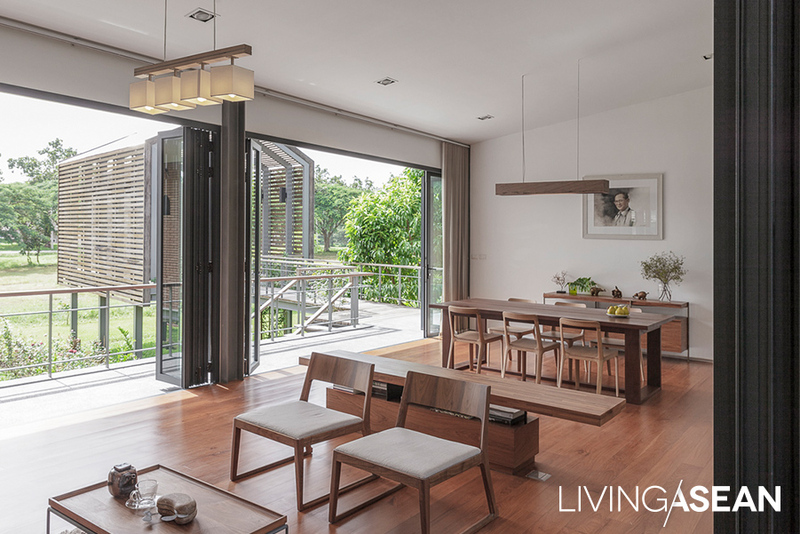 Baan Boon Home has a floor space of 190 square meters, with enough functionality to completely meet the needs of the fivefamily members. 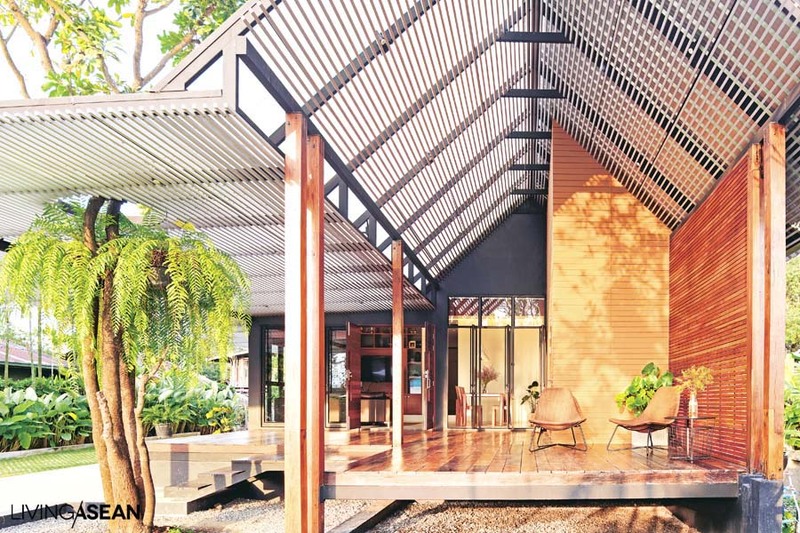 The rear section of the house has a high-gabled roof which overlaps the lower-gabled front, where the corrugated roofing is translucent, allowing natural daylight to shine in, an especially effective way to keep the 9-meter-deep verandah light and cheerful. 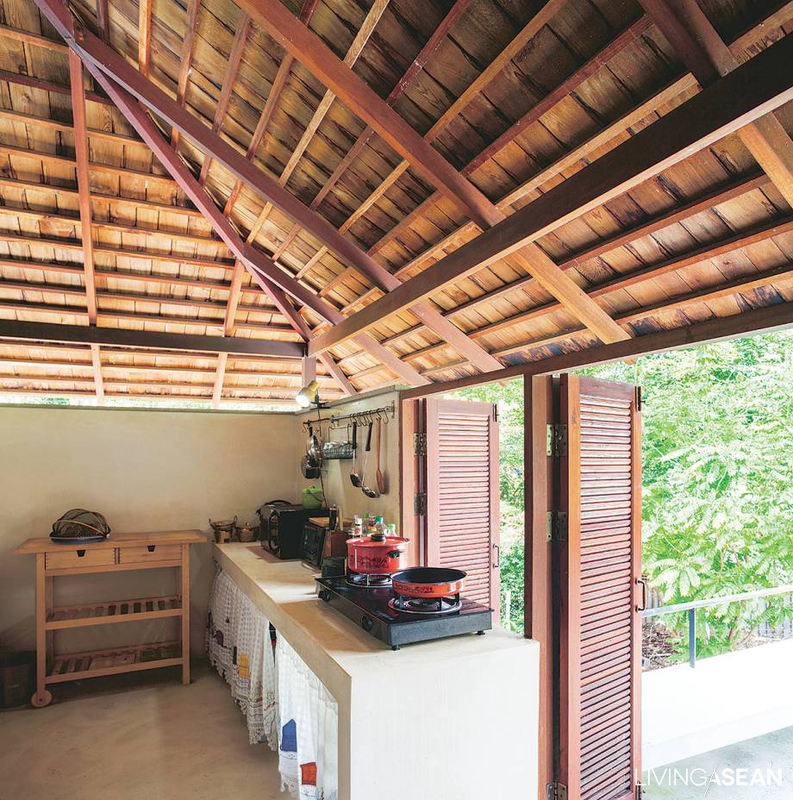 Another unique feature is the placement of the kitchen at the front of the house, with the thought that family members will tend to enjoy most sit-down meals together on the verandah. 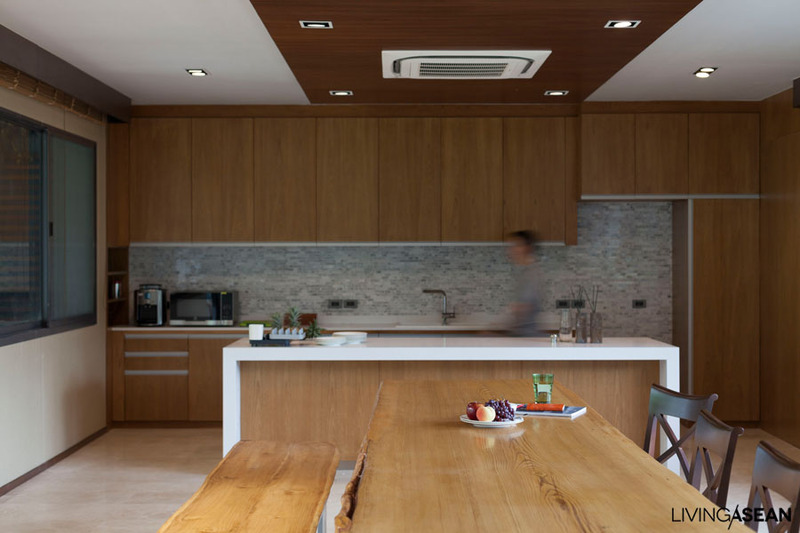 The kitchen is fully enclosed, and the walls have grooves etched and painted to resemble wood grain, all giving a clean, proportionate look to a highly practical design. 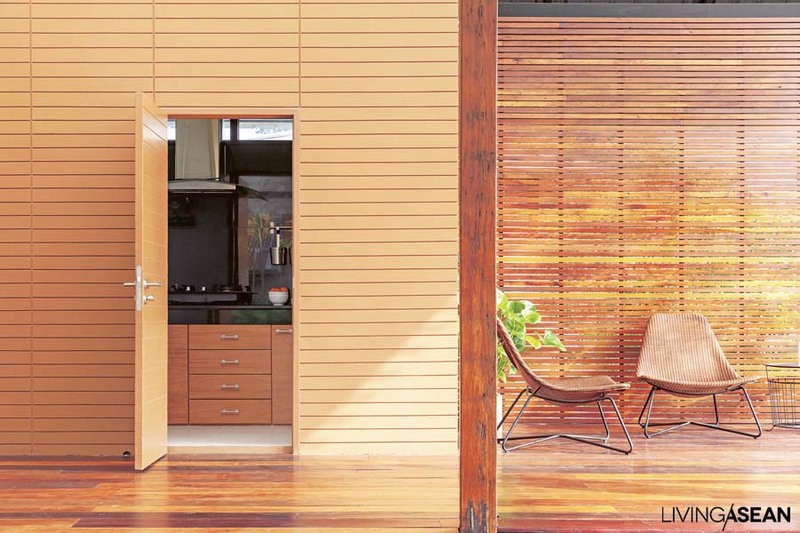 The wood used to build the house is mostly – 90% or more – real wood taken from the old house. 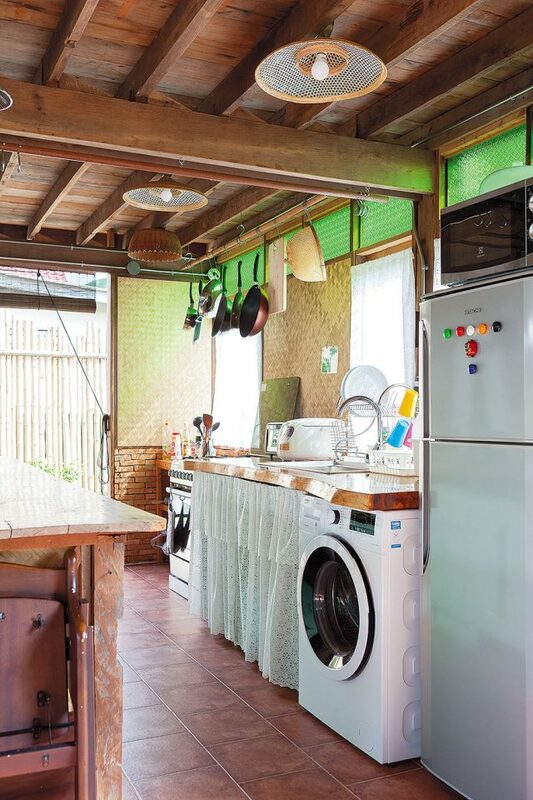 This saved on the budget, and only the high-quality, strong wood was used, but the marks on its surface speak of character, faithful service over time, and add charm, keeping lifetimes of family memories alive and shining into modern times.